That’s the word 82-year-old Gene Burd uses to describe himself as the longest serving professor in the School of Journalism at the University of Texas at Austin. A man who has taught 18 courses at the university. 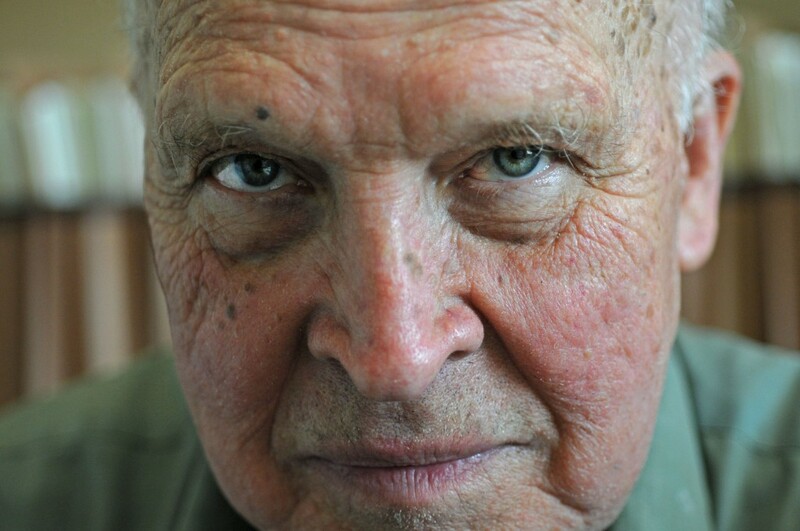 A man who has supervised more than 70 master’s theses and 6 doctoral dissertations. A man who is being ushered out of the university in May 2014 due to his insufficient service. 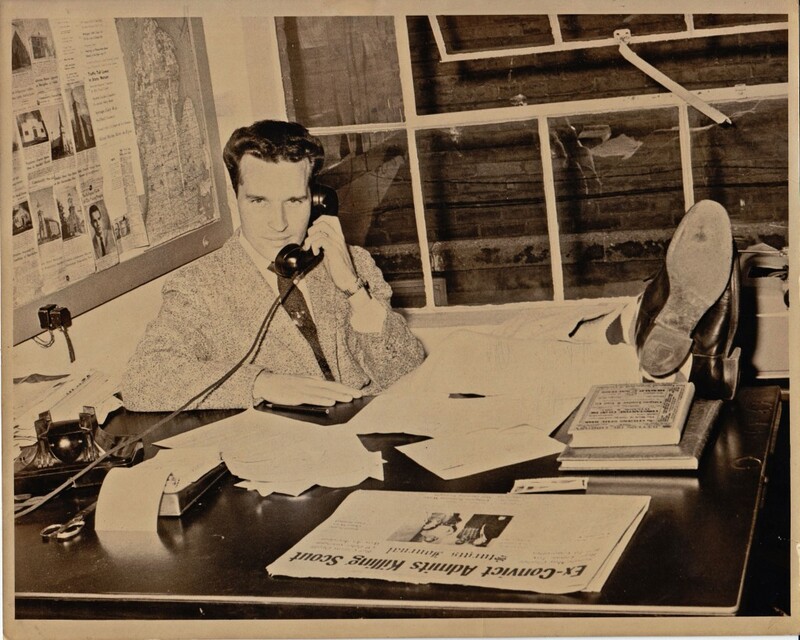 Mr. Burd witnessed the hire of Wayne Danielson in 1969, the first dean of the College of Communication. He has taught long enough to see 12 chairmen pass through the department of journalism. 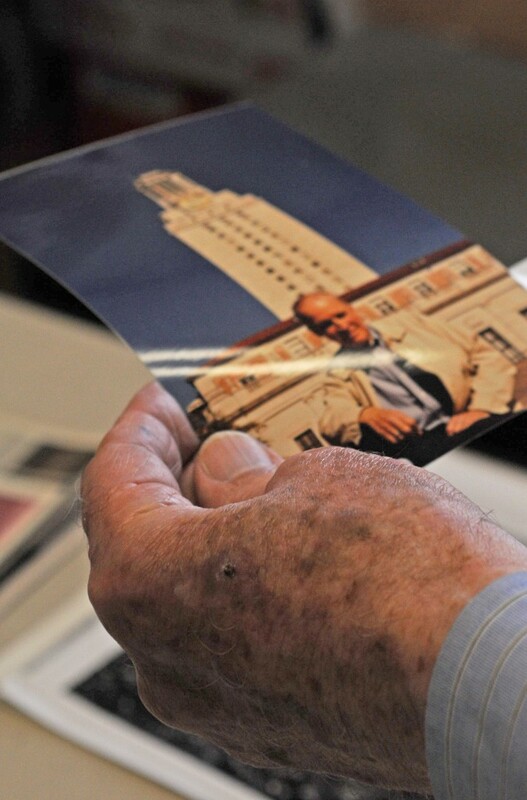 “Three post offices, three city halls, three public libraries, nine governors, eight university presidents and seven football coaches,” Burd said as he grinned in remembrance of his time spent at UT. Burd was homeless when he first moved to Austin; he didn’t know anyone and didn’t have a place to stay. He spent his first few nights in the only Austin homeless shelter at the time, before it moved to its current location near Eighth and Red River streets. “They didn’t put enough salt on their beans,” Burd said as he reflected on his time spent in the Salvation Army. Rain or shine, Burd walks to UT campus from his apartment near Barton Springs road and South First Street. He does not use a cane, he does not get winded and he has never driven a car. 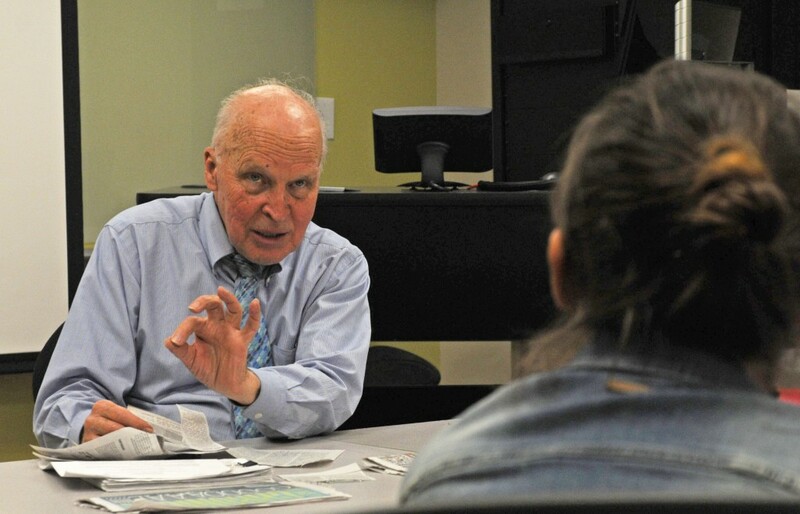 Although he buys his clothes from the Salvation Army, Burd recently gave away 1.5 million dollars to two journalism-related organizations throughout the country. As we walks home, Burd checks every parking meter for coins. In his spare time, Burd collects chicken stamps. 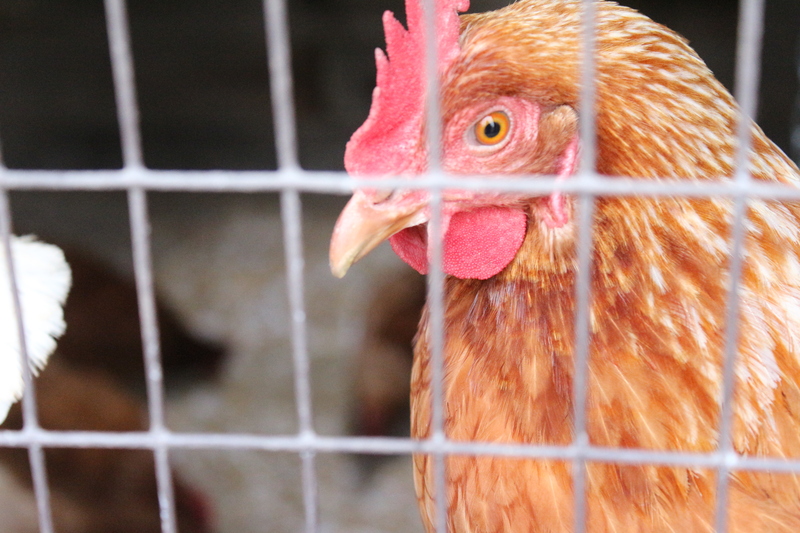 His interest lies in the fact that they are disrespected; Burd says they kindly give their flesh and that it’s demeaning to call someone a chicken. When asked about his feelings of leaving the university after 42 years, Burd says he will miss the student’s the most. In reflection of his time spent here, Burd says he never gave up on the corporate, institutionalized system on the Forty Acres. Ribbeck after arriving in Anchorage. 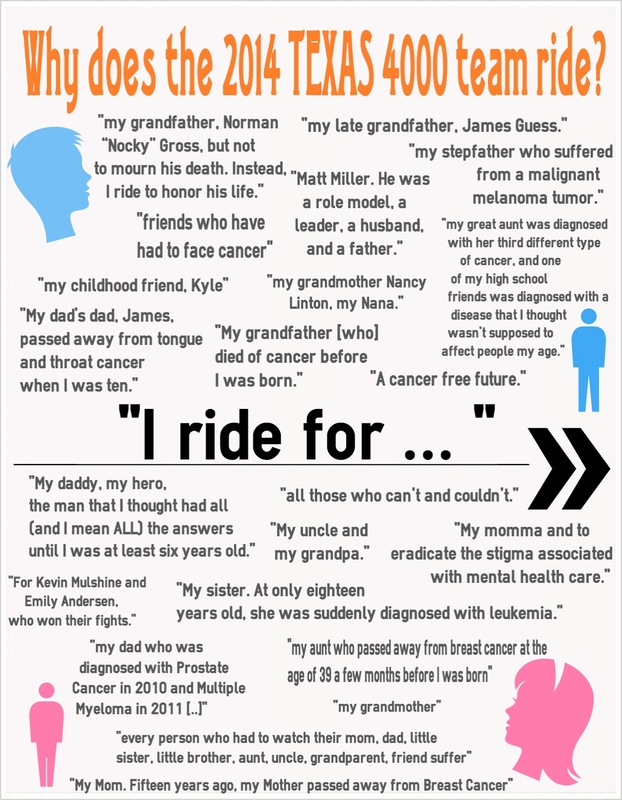 For most Texas 4000 riders, the inspiration to make the journey from Austin to Anchorage comes from second hand experience with cancer. 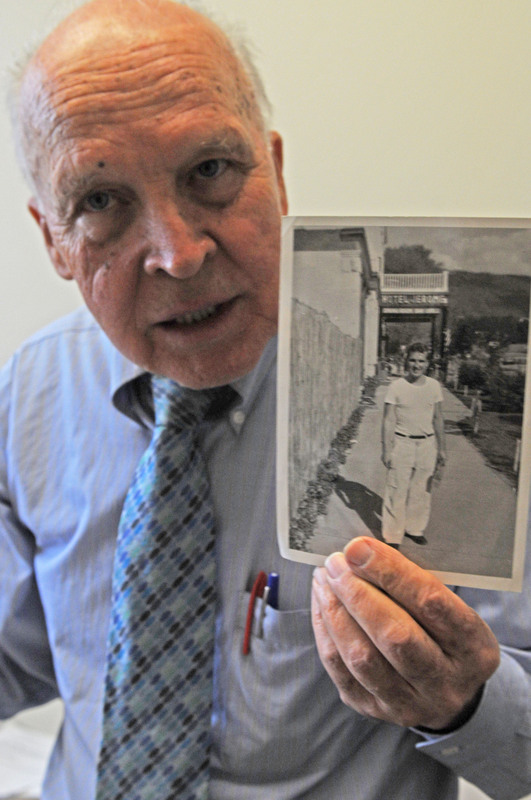 For Bucky Ribbeck, it comes from his personal struggle with the disease. 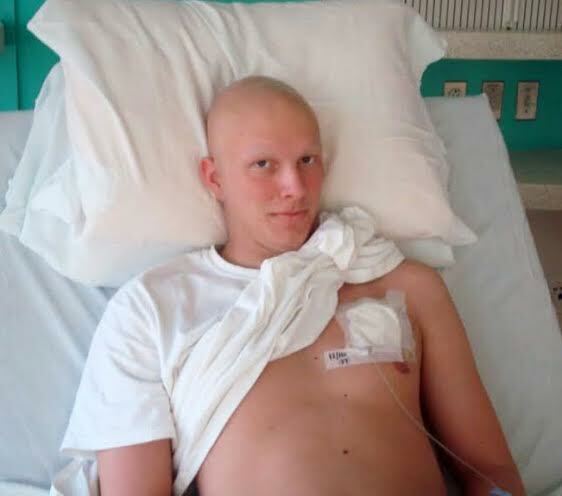 Ribbeck was diagnosed with Ewing’s Sarcoma as a junior in high school after suffering a sudden severe pain in his arm during baseball practice. Within a two-week window following the initial pain, Ribbeck was beginning treatment at Texas Children’s Hospital in Houston. While a patient on the ninth floor of the hospital, Ribbeck met and befriended Natalia Lopez, a fellow cancer patient receiving treatment. Lopez passed away on Oct. 28, 2009 and while Ribbeck recalls it as one of the worst days of his life, he keeps a part of his fallen friend with him at all times. Ribbeck received his last round of treatment in December 2009 and has been cancer-free ever since. When he arrived at UT in 2010 and learned of Texas 4000, Ribbeck knew immediately that it was a program he wanted to be a part of. Ribbeck on his final day of chemotherapy. 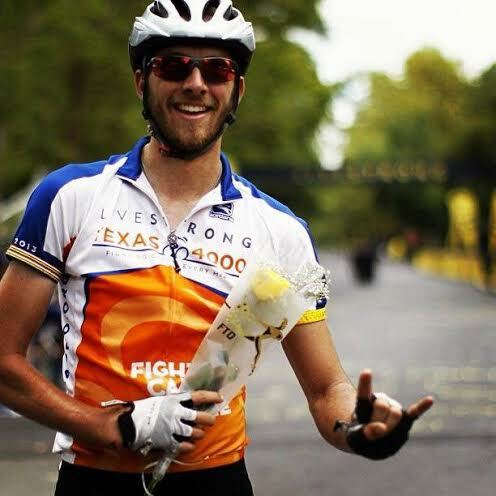 “I chose to do Texas 4000 to inspire hope in everyone I knew and everyone I would come to know who was affected by cancer,” Ribbeck said. 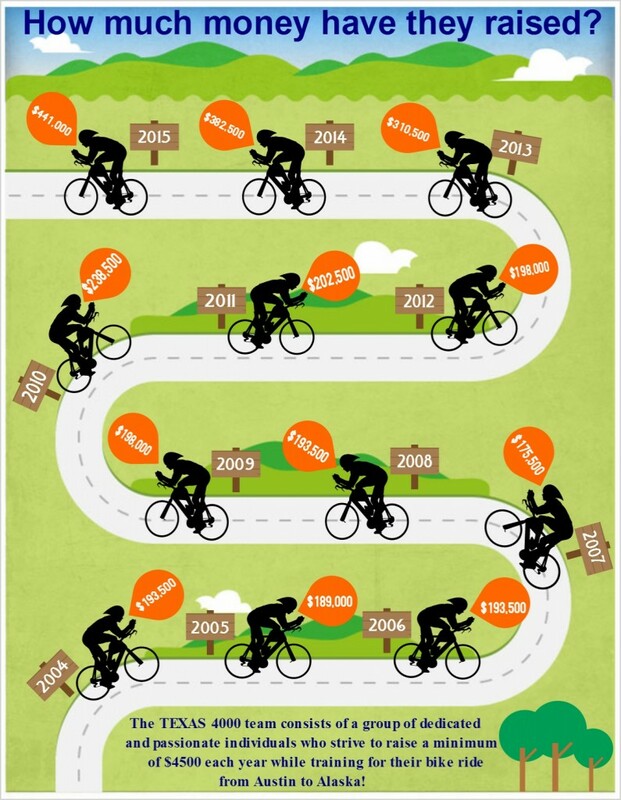 Because Texas 4000 is a 70-day bike ride from Austin, Texas to Anchorage, Alaska (roughly 4,000 miles), riders endure a rigorous training, working out regularly and logging 1,500 training miles the spring before the ride. Ribbeck made the ride in the summer of 2013 and for him, no amount of training could have prepared him for what the trip would truly be like. It has been almost a year since his 70-day ride to Alaska, but Ribbeck looks back on his time with Texas 4000 fondly. Ribbeck also views his experience as something that cannot be explained by words or emotions. 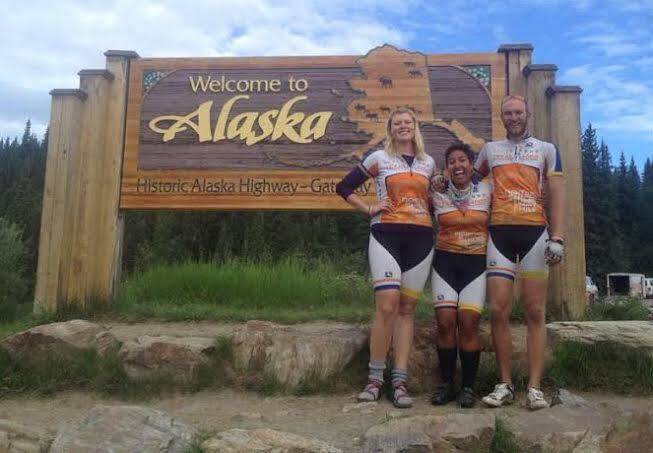 Ribbeck and his fellow riders at the Alaskan border. Although Ribbeck’s Texas 4000 experience is over, he is still committed to fighting cancer and showing those currently battling the disease that their illness does not have to define them. He is particularly inspired by the poem “What Cancer Cannot Do” because it explains that, while cancer can do horrible things to a person physically, it cannot break the fighting spirit that Ribbeck and his friends from the ninth floor, particularly Lopez, exhibited. The Texas 4000 organization requires each of its members to raise $4,500. Below is a representation of the amount of money raised by Texas 4000 teams since 2004. 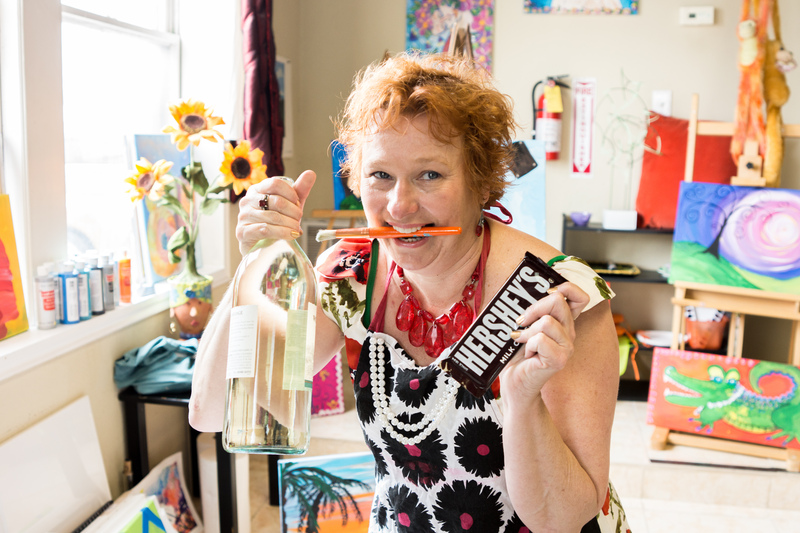 A self-proclaimed "extreme artist and master educator," Keller tells me she wants to go with a martini, a bar of chocolate and a paintbrush. One of her favorite aspects of her job now is that she doesn't have to grade anybody. 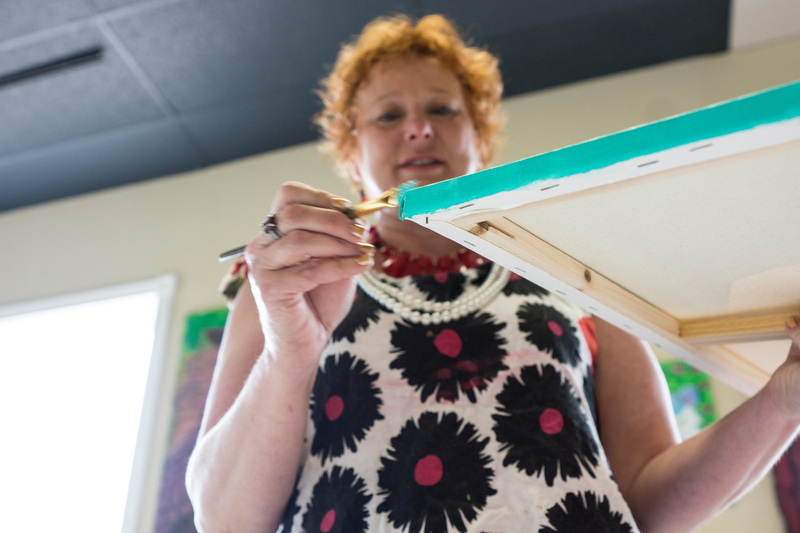 For her painting parties, Keller likes to focus on one subject for everybody. Here, it's alligators. 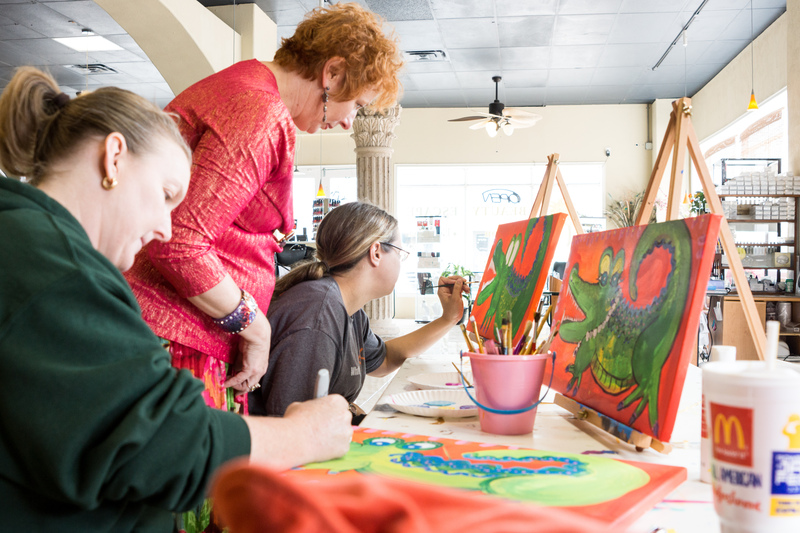 Two of her former co-workers joined her to paint. 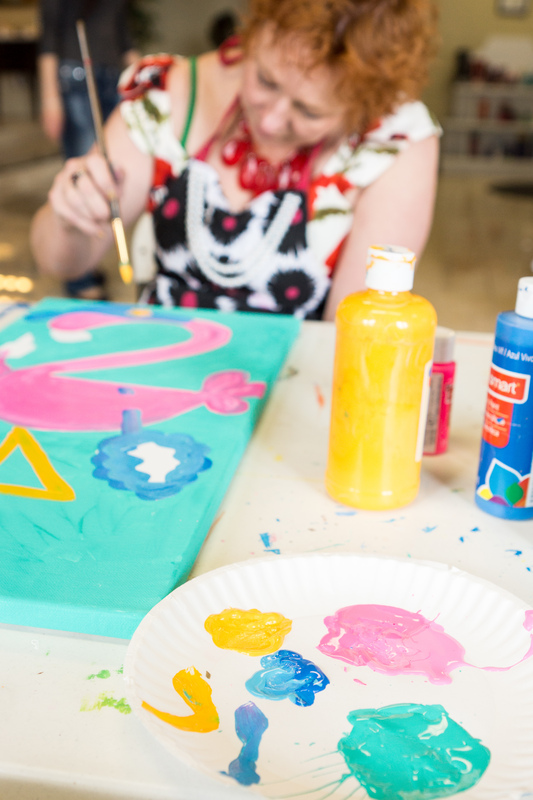 In the foreground, you can see her completed flamingo. One of Keller's previous painting she titled "Caffeinated Giraffe" due to the number of coffees she had drunk the day she painted it. This painting was inspired by a ceramic plate she has. 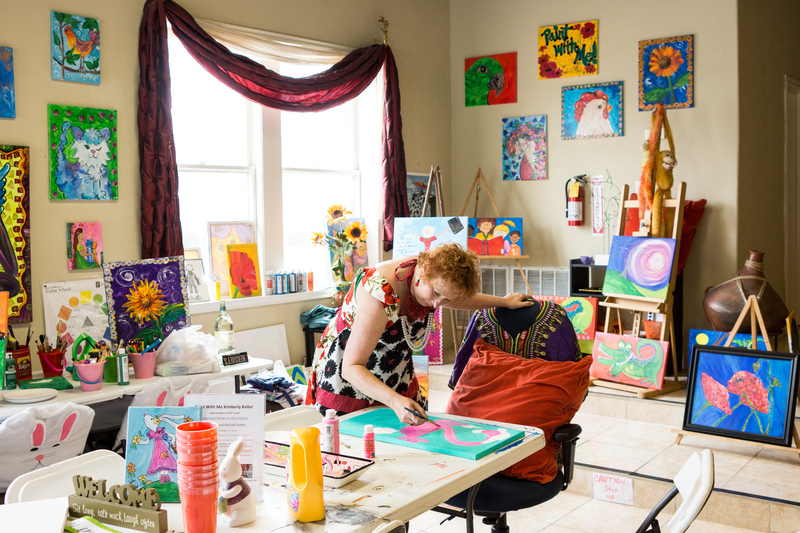 Her studio is full of bold colors and a variety of subjects. This painting is, Keller tells me, her favorite painting. Her latest work, a flamingo, only took her about two hours to complete. She also likes to encourage her former students artistic side. 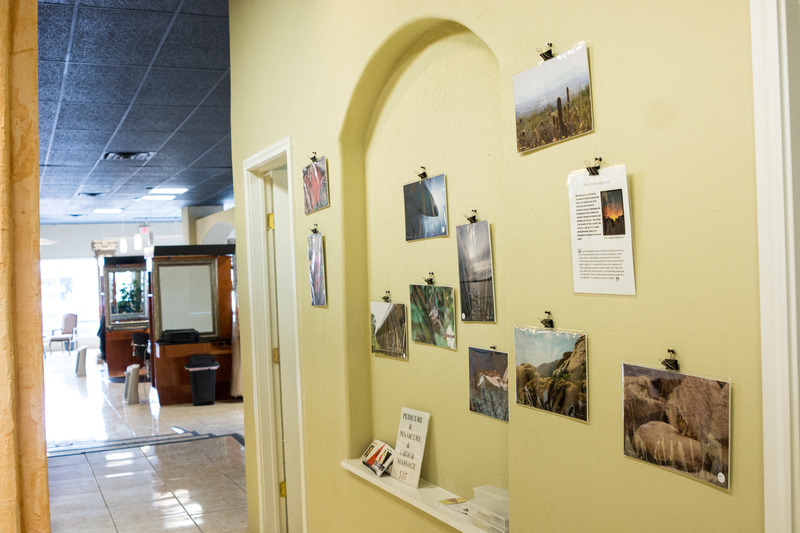 Here one student's photography is displayed for sale. 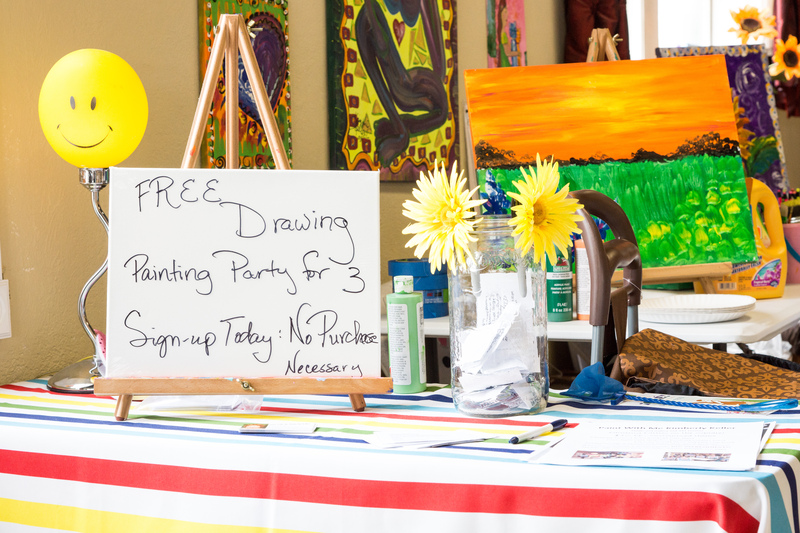 Part of her business is hosting painting "parties." Keller has only been in her new space for about a month. She likes to paint fast, with bold colors. 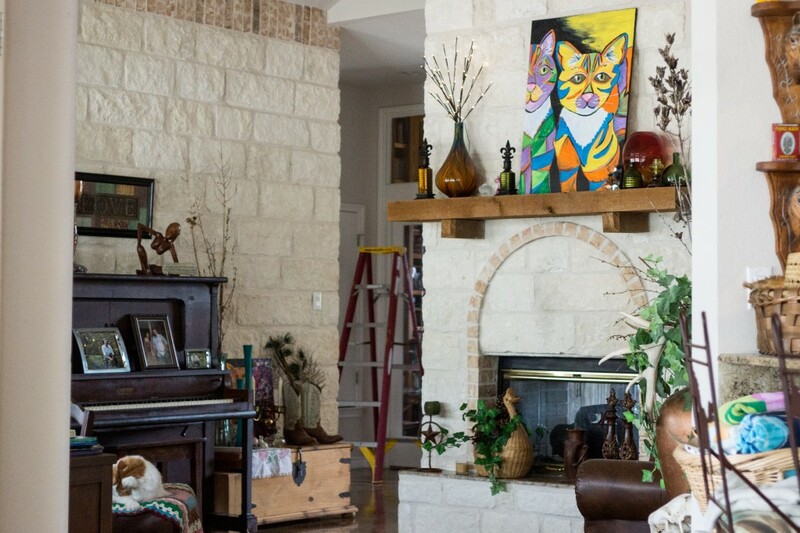 Keller has lived in Georgetown, Texas her entire life. 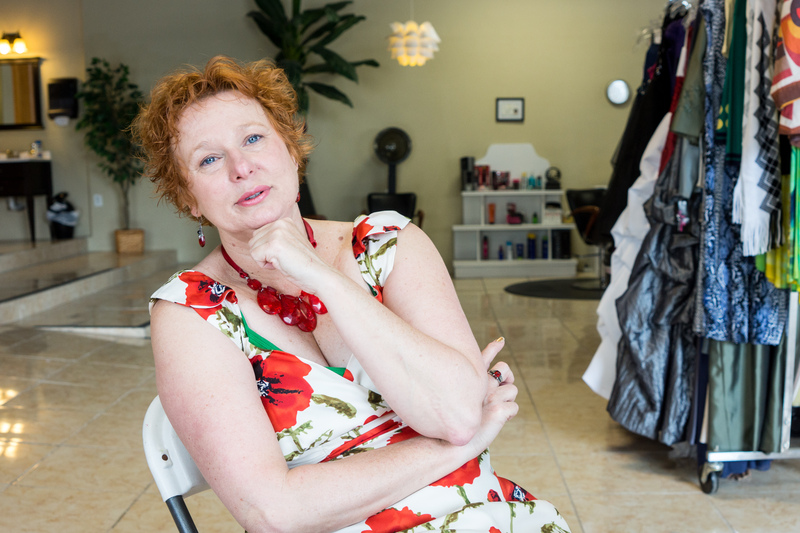 Keller's studio is located in an unassuming salon in Georgetown. Keller paints in her studio. Kimberly Keller is a firecracker of a person. Literally. Her nails are painted gold. Her jewelry is orange and red. She’s wearing a sleeveless dress with huge pink and yellow flowers. And her hair is the vibrant orange of a sunset. 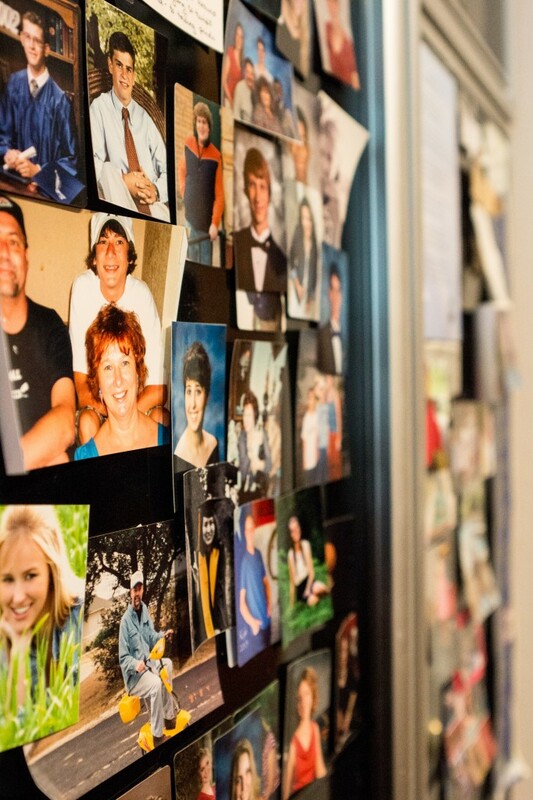 Keller’s fridge is covered in pictures, many of them past students. 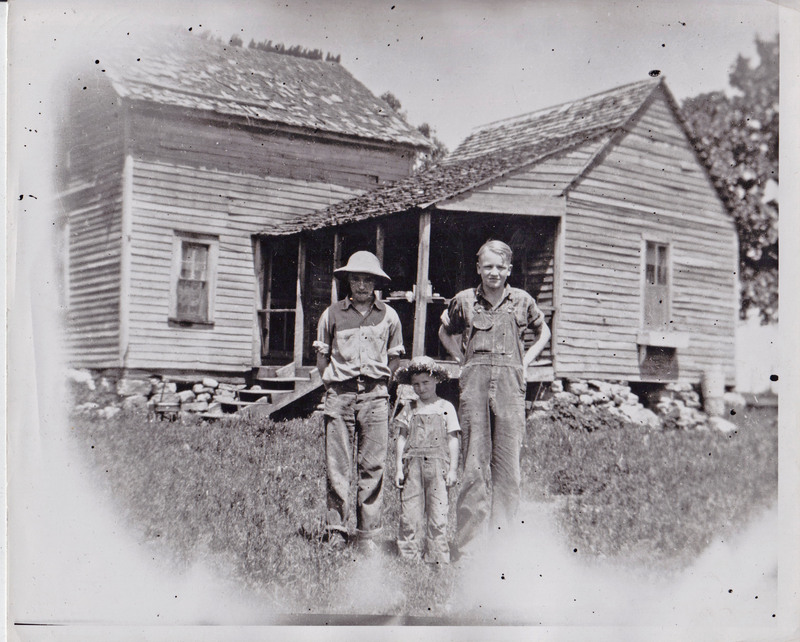 Keller was born in Georgetown in 1962 to Mamie Ruth and Daniel Richter. She grew up in Georgetown schools and was a self-described “regular cowgirl.” By the time she was six, her family had moved to five and a half acres on Georgetown’s eminent Williams Dr. In high school, she was a Georgette (“My high-kick wasn’t high enough!”), but filled a lot of her time with the 4-H Club showing lambs, turkeys, cows, sheep and pigs. Her counselor told her parents not to waste their money sending her to college. Luckily, that advice was ignored. Keller attended Blinn College in Brenham, Texas in the fall of 1981 before she transferred into Texas A&M in the next semester. But by the fall semester of 1982, Keller was back in Georgetown, having transferred to Southwestern University. She was already working as a substitute teacher. To anyone who knew Keller, this probably did not come as a huge surprise. Her mother, Mamie Ruth Richter, told me she didn’t know that Keller would pursue art specifically but “she always told us she wanted to be a fashion designer” and would draw patterns for her grandmother, a seamstress, to make. I ask her mom if she ever does art projects with her daughter. Her husband, who currently works as a credit consultant for Dell, doesn’t either. If you want to get a good idea of their relationship, you just have to listen to his comparison of their gardening techniques. Keller thinks this is hilarious. “But I’m constantly showing people her Facebook pictures she painted or one of her animal drawings,” he says. And some of his friends attend the painting classes Keller conducts. Keller attributes her liking of art to the fact that she could paint well in comparison to how she did in math or reading. And her art teachers encouraged her. In fact, she tells me someone attempted to buy a painting she did in junior high for five dollars. “I said no,” she says, laughing. Her mom proudly displayed it in their home. She married her husband Mike in between rounds of finals in 1983. And she graduated from college in 1985, jumping right into the work force as a kindergartener teacher. In 1993, she tells me she became the first art teacher in G.I.S.D., teaching both kindergarteners and first graders. She had over a thousand students. After her first child, Ashley, was born in 1987, she was back at work after only 20 days. However, after her son, Aiden, was born in February of 1994, her doctor told her she couldn’t go right back to work. So in the fall of 1994, Keller began teaching at the high school, until the tragedy at Columbine High School in April 1999. Mike wanted her to quit teaching at the high school level while their two young kids were little. So she worked as a substitute teacher at the same Zion Lutheran school her son started school at until 2004 where she became a elementary school art teacher for Cooper Elementary. And in 2009 she found herself teaching art to ninth-graders part time, which became full-time in 2010. 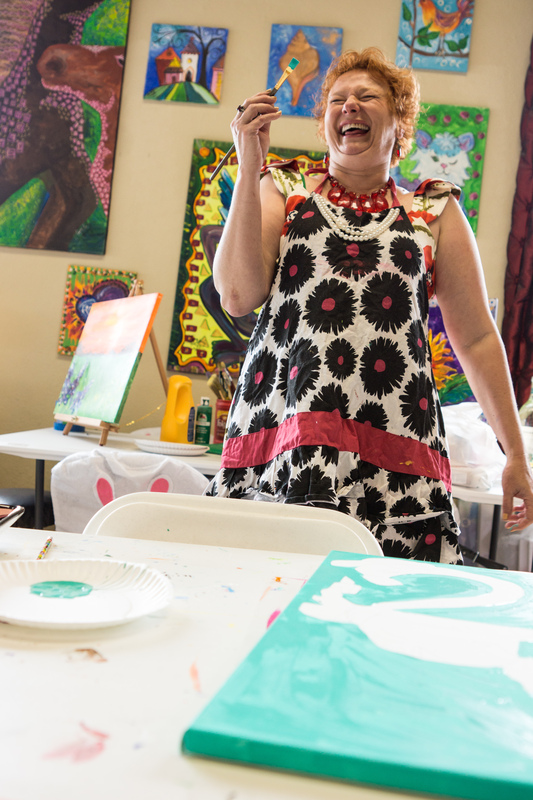 Until two years later, when her favorite classes – painting and ceramics – were given away to another teacher. She taught for one more year at Gateway High School. That fall she decided to spend more time on family. She feels strongly that if you aren’t going to act like a parent and a good role model and be willing to devote time to kids, you shouldn’t teach. 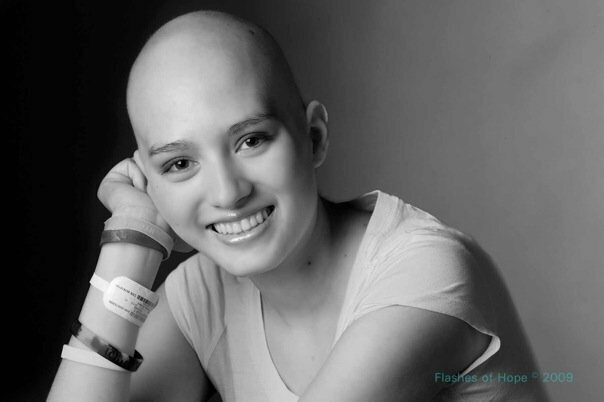 And her father had just been diagnosed with cancer for the third time. “When it comes down to it, family is family,” she tells me. Coincidentally (and awfully) last November she was driving by her old house on Williams Dr. where she grew up a week before her dad died and saw bulldozers tearing it down in order to build apartments. She doesn’t drive by there anymore. 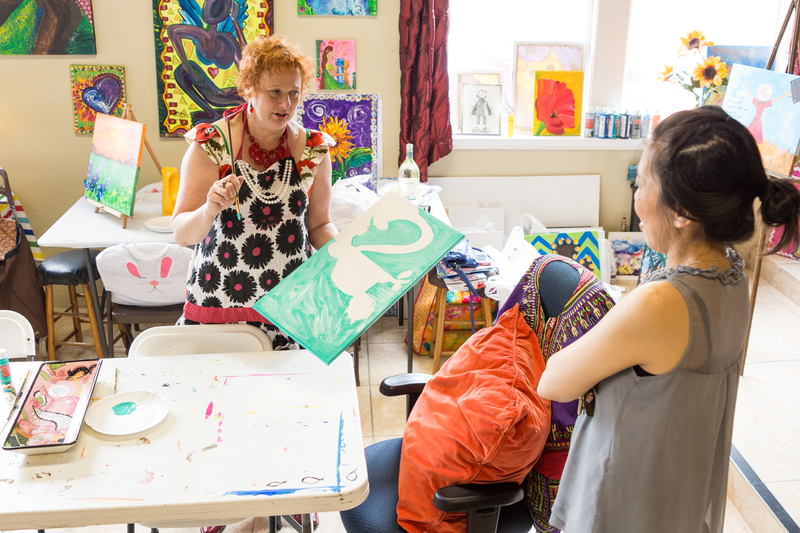 Now she works as a “self-proclaimed extreme artist.” For a short period of time, she rented space in a gallery in an attempt to showcase former students’ work, wanting to give them “experience and better understanding” of how business runs, but that gallery was closed last month. 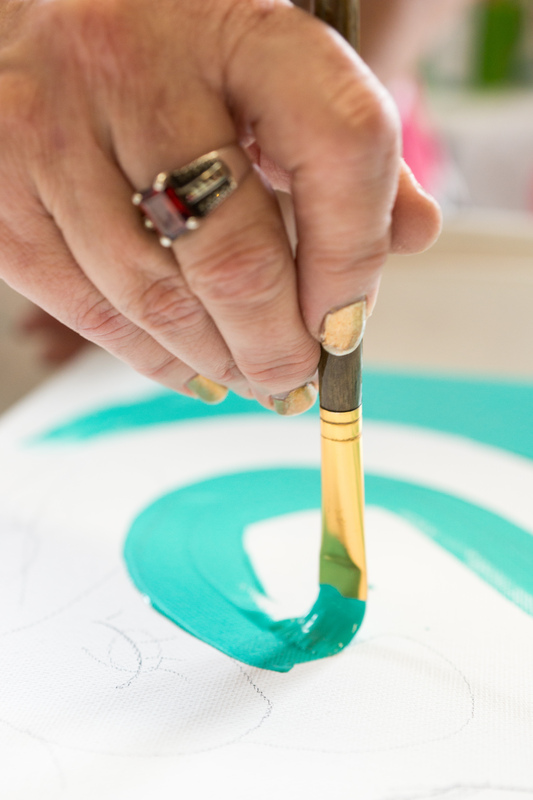 Keller hosts painting parties, packing all her canvases and paint and brushes into her small green hatchback and driving out to people’s houses. She also like the teaching people to paint without having to grade them. “You pay me $35, and I’ll give you a 100,” she tells me, grinning. 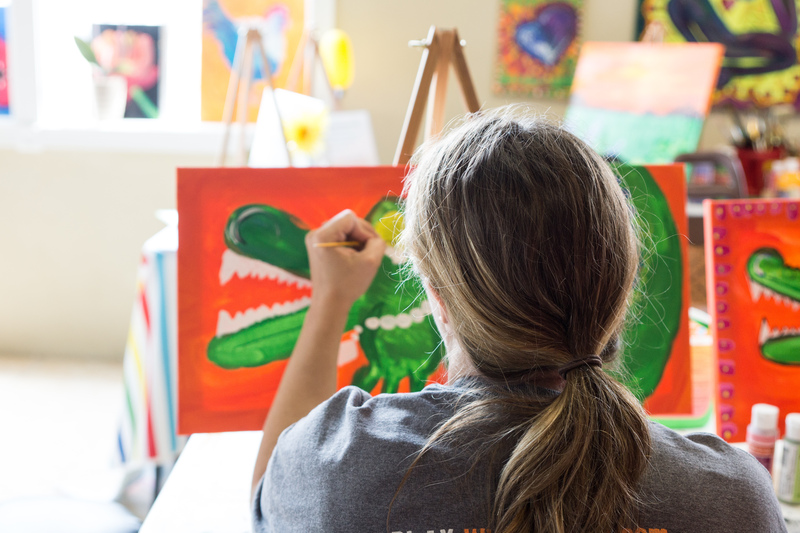 Two of her former co-workers from Gateway, Jennifer Foran and Nicole Phillips, were in her studio on Sunday, painting alligators. I asked them what they enjoyed about painting. “That I surprise myself,” Foran says. And Phillips agrees. Keller’s studio is no exception. It’s full of paintings with bold colors and sweeping strokes. Every painting is different. 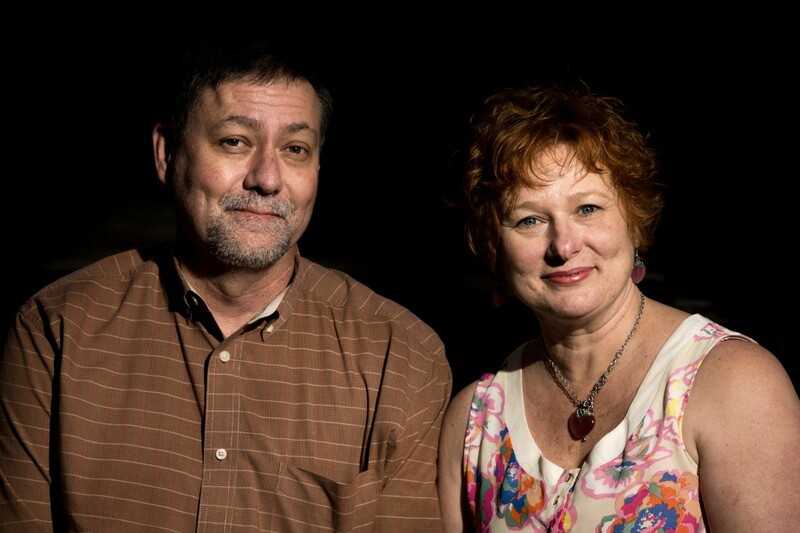 Mike and Kimberly Keller have been married about 30 years. Bitcoin is a different thing to different people. 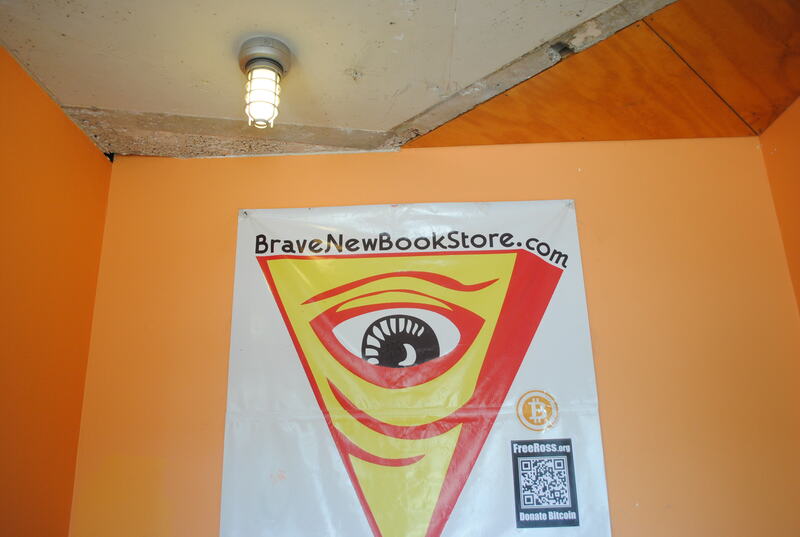 To Harlan Dietrich, owner and founder of Brave New Books, a political bookstore and early adopter of Bitcoin, the currency represents the beginning of a decentralized era. To Steven Wilkinson, founder of Austin Bitcoin, it’s the good equivalent to money’s evil. To others who were introduced to the coin after the takedown of the online drug market The Silk Road, Bitcoin is the currency used to buy illegal substances online. 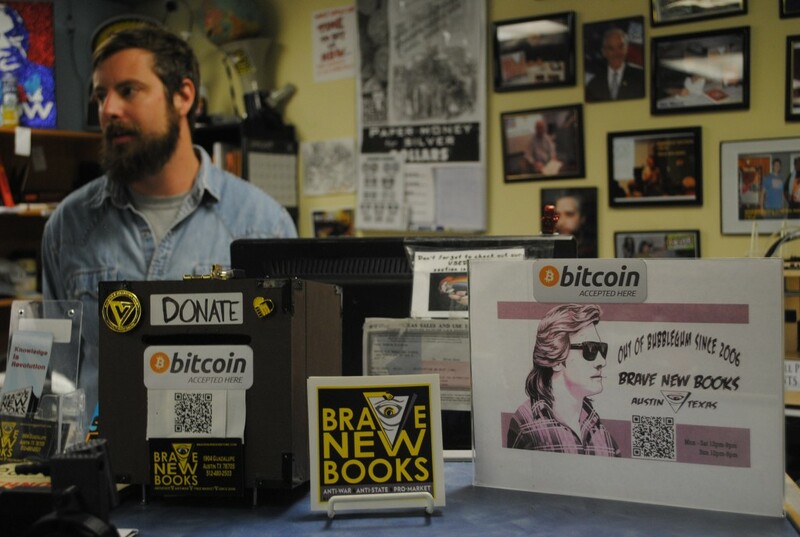 Harlan Dietrich, owner and founder of Brave New Books, an underground political bookstore, began accepting Bitcoin two years ago. 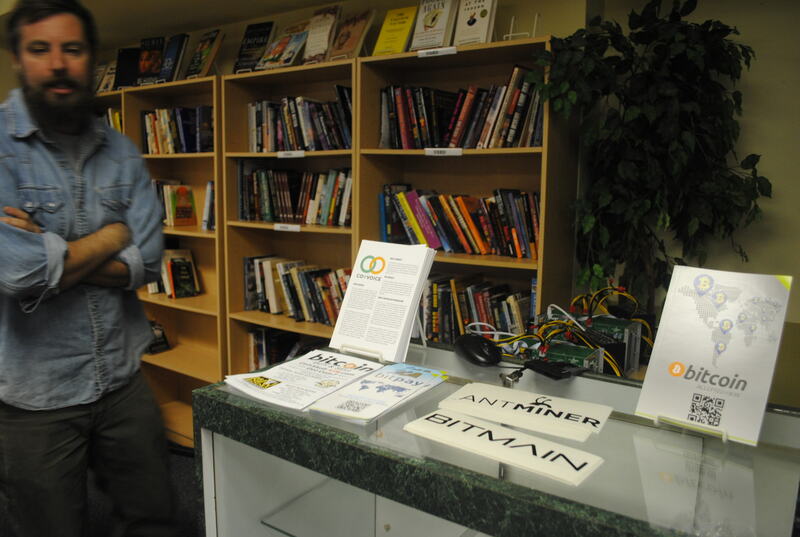 In truth, Bitcoin is the world’s “first decentralized digital currency.” Though it is gaining traction now in 2014 through the implementation of various Bitcoin ATMs cross-country, the cryptocurrency was created in 2009 by the mysterious figure by the name of Satoshi Nakamoto (a pseudonym). The draw of the coin for many of its followers has much to do with the fact that the currency is not regulated by any central authority. 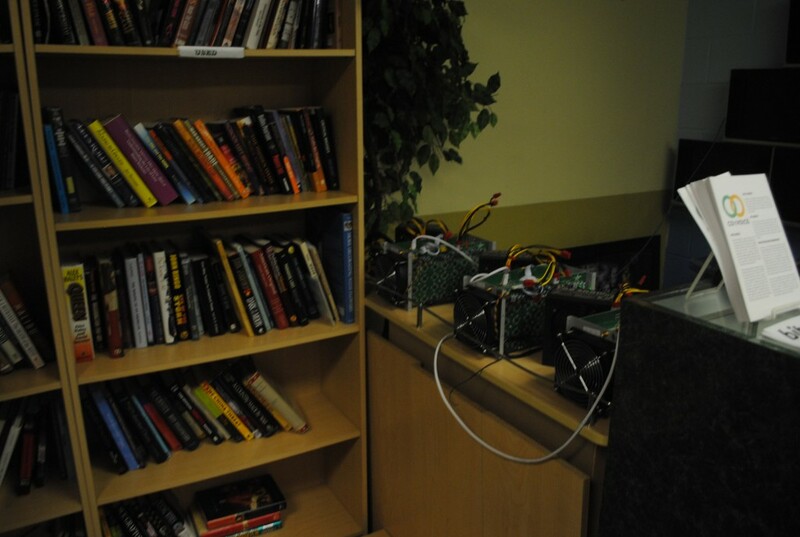 Instead, a mathematical network existing in a cloud system visible to everyone monitors the creation of new Bitcoins. 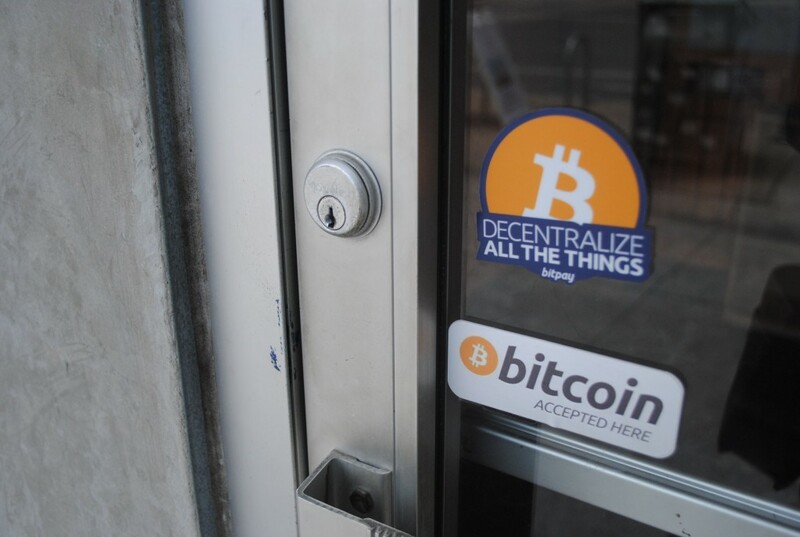 Currently in Austin, there are three Bitcoin ATMs and about ten stores that accept Bitcoin as payment. “Everybody’s looking at it. It gives us the ability of not having to trust an individual or a group or even an organization or a governmental structure. We can actually trust mathematics,” says Steven Wilkinson. The mathematical system generates Bitcoins through a number-crunching process deemed “mining.” The mathematical equation running the system, the “mining” process, makes the creation of Bitcoins more sparse over time eventually creating the 21 million Bitcoins that the mine is limited too. Once the mine is tapped out, so to speak, no bank or reserve can release new Bitcoins to devalue the money. Harlan Dietrich owns three Bitcoin “mines.” Every ten minutes, his mines generate more Bitcoin and he reaps the benefits. This process that favors saving versus spending is one reason Harlan Dietrich adopted the cryptocurrency and hopes to see its reach expand. Bitcoin is a deflationary currency. There will only ever be 21 million Bitcoins in existence once the entirety are mined. Dietrich and many other cryptocurrency supporters point to the economic events of 2008 as an example of how saving is “punished” in our current system of currency. “There was going to be havoc in the streets if we did not bail out the biggest banks. You would go to your ATM and it would say ‘Sorry. We’re out of money,” says Dietrich. 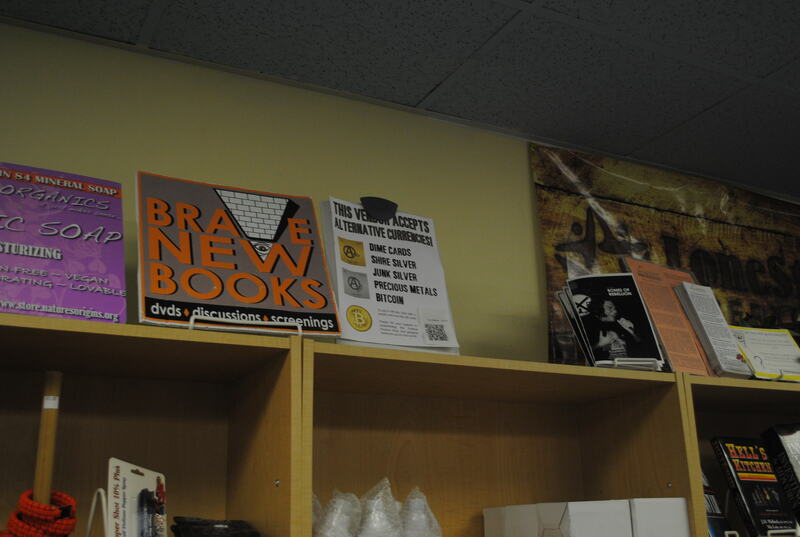 Brave New Books bookstore hosts gatherings in which people discuss the potential of Bitcoin. Despite the enthusiasm of Bitcoin and its supporters – and they are a enthusiastic bunch, replete with a stock of corporate PR moves like a Bitcoin mascot and convention – Bitcoin has faced several stumbling blocks in its route to global conquest. Earlier this week, the bankrupt Bitcoin exchange MtGox (previously the largest in the world), announced that it had found previously stolen bitcoins, bringing to light security issues many Bitcoin opposers are concerned with. Likewise, China outlawed the use of Bitcoins by financial companies early this year. Die-hard fans like Dietrich and Wilkinson can’t yet be fazed however. To them, Bitcoin represents the potential for change in various arenas. “It’s technology. It’s a double-edged sword. You can have it do good or you can have it do bad. I think primarily, it’s going to be done for good,” Wilkinson says. Most proponents of Bitcoin appreciate the decentralization of the currency. The clinch is a unique stand-up grapple that Muay Thai uses, separating it from other styles of kickboxing. Follow through and correct application are stressed in Muay Thai. Nhan Pham is another instructor who teaches Muay Thai, as he and Vera tag team to show the correct way to perform moves. Muay Thai is known as the art of the eight limbs, as it incorporates the use of the hands, feet, elbows and knees. 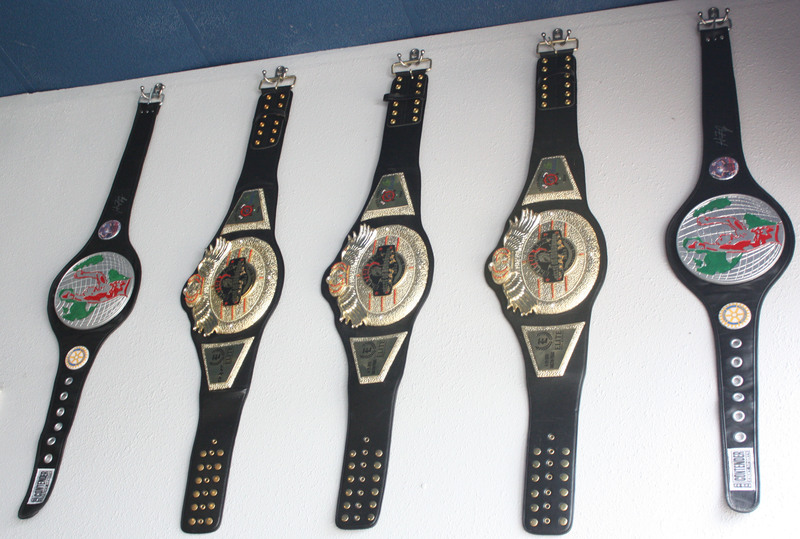 Students from six-years-old to 64 come through the doors of the Austin Kickboxing Academy to learn Muay Thai. There are no standard Muay Thai events in Texas. As a result Vera and his students practice the form and use its basic skills in other competitions. Many people will tell you that video games are simply a childish activity that one eventually outgrows. Some will even say that video games have no substantial value at all in human life. But for others, the excitement of these virtual, action-packed worlds can ignite a passion and launch a career. Randy Vera, Muy Thai instructor at Austin Kickboxing Academy is one of those who was deeply inspired by the games he played as a boy—Street Fighter to be exact. At age 14, he combined his passion for martial arts with ambitious desire to bring his virtual world to life. Muy Thai, sometimes known as the “art of the eight limbs” is a particularly violent martial art which involves the extensive use of elbows and knees, in addition to kicks and punches. It is characterized by a square stance that is similar to boxing but employs less lateral movement. Muy Thai is also well-known for its concept of the clinch, a standup version of grappling. Because of this very isolated, straightforward form, intense training is required with a special focus on balance and speed. Training regiments can range from between once or twice per week, to two times a day, six days per week. Learning the basics of how to attack with elbows, knees, kicks and punches can take more than a month or two each, according to Vera. Vera has been training in Muay Thai for the last 20 years, and has been instructing for the last 10 in Austin. He takes in students into his academy from ages six to 60 or even older. Vera teaches Muay Thai to students who range in age, from six years to 60. He says there are several benefits to learning the art besides merely acquiring skills in combat and self-defense. Despite the high level of effort required to train, students don’t have much opportunity at all to compete in the art of Muay Thai in Texas. Vera says it is easier for students to compete in Texas by learning Muay Thai and applying it to other forms of martial arts in MMA training. One of Vera’s students, Brittany Robertson, has been training in Muay Thai since 2007, and under Vera since 2008. She says her goal is to simply be the best fighter she can be, regardless of any restrictions on competition in Texas. “I’m striving for perfection,” Robertson said. “The perfect technique for offense and defense and for controlling and conducting a match. 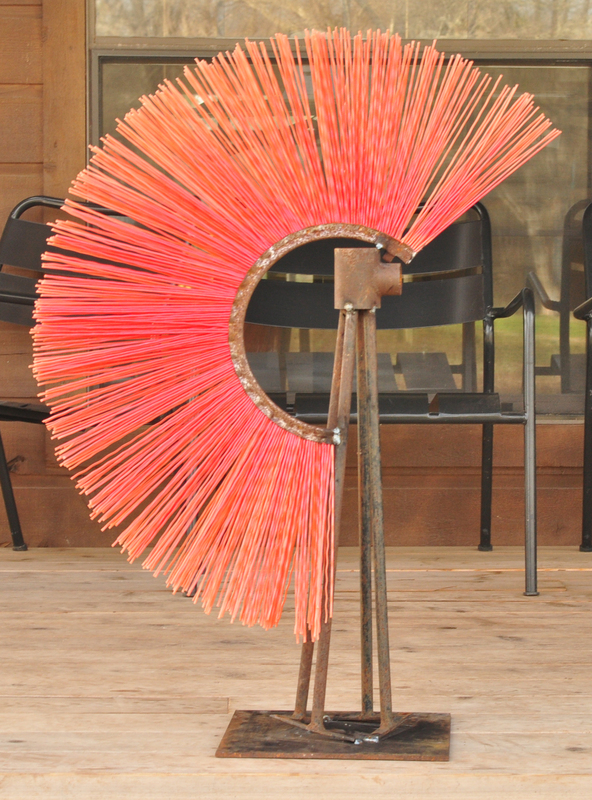 Jack Sanders demonstrates basic welding methods on a piece of scrap metal. Photo by Caroline Khoury. 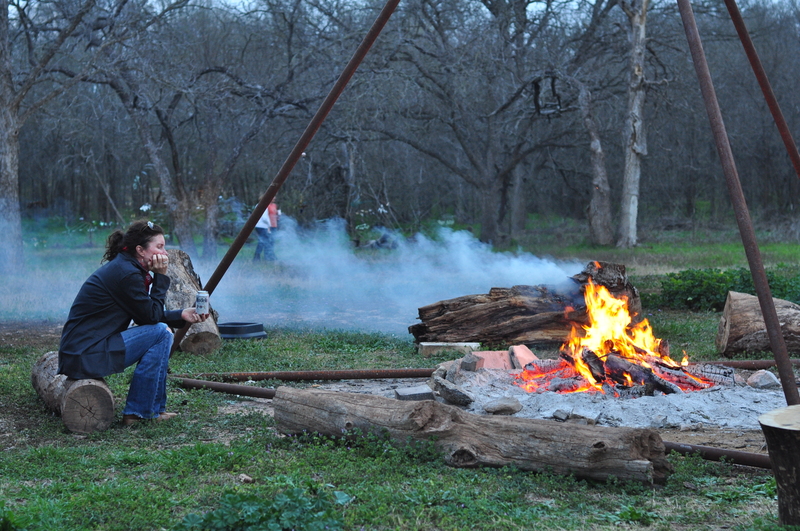 Participants clad in long-sleeved shirts, pants, gloves, and safety goggles gathered around the welding table where Austin, Texas artist Jack Sanders and owner of Design Build Adventure demonstrated basic metalworking techniques. The group attended Sander’s inaugural “Yoga and Welding” one-day workshop the first Saturday of this month to try their hand at welding. The day started with a yoga and meditation session designed to provide a mind-body experience to prepare participants for a day of metalwork. 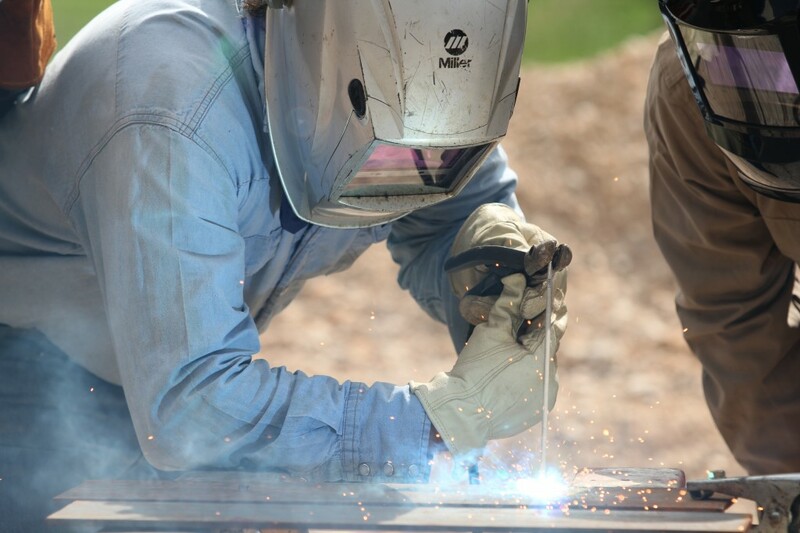 The session followed with a brown-bag lunch and lecture with Sanders where he discussed the safety rules and basics of welding. “If you were to ask me what a perfect day would be, it would probably be something along the lines of spending two hours in the morning doing yoga and then building stuff the rest of the day,” Sanders said. With an enrollment fee of $125 per student and a maximum of ten students, the one-day workshop sold out in a week. 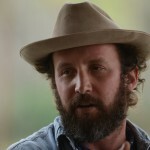 Sanders founded Design Build Adventure in 2005 with the mission of educating and serving in mind. But his interest in design go back to the playground in Kindergarten where he recalls stacking sticks to create little campfire scenes. In high school, Sanders said he took pride in the composition of lines in the lawns he mowed and how straight he could mow the edges. 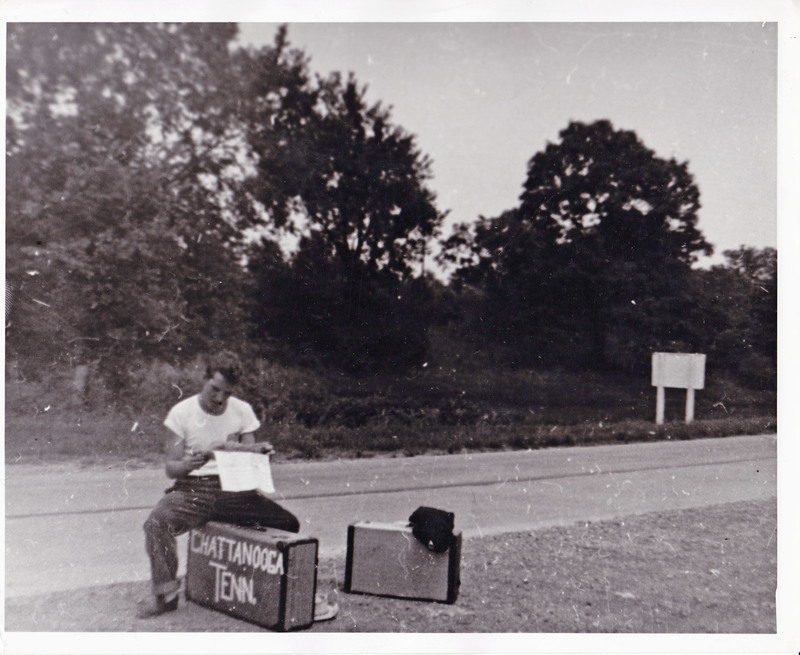 After graduating from Auburn University, Sanders said his experience of being a student, an intern and later an instructor at Rural Studio, an undergraduate program of the School of Architecture, gave him a unique set of skills and interest. “It was very clear from the earliest days after I graduated that I was going to have to author or write my own job description,” he said. The name for Sander’s business came to him when he realized the experiential technique and process he and his team used. 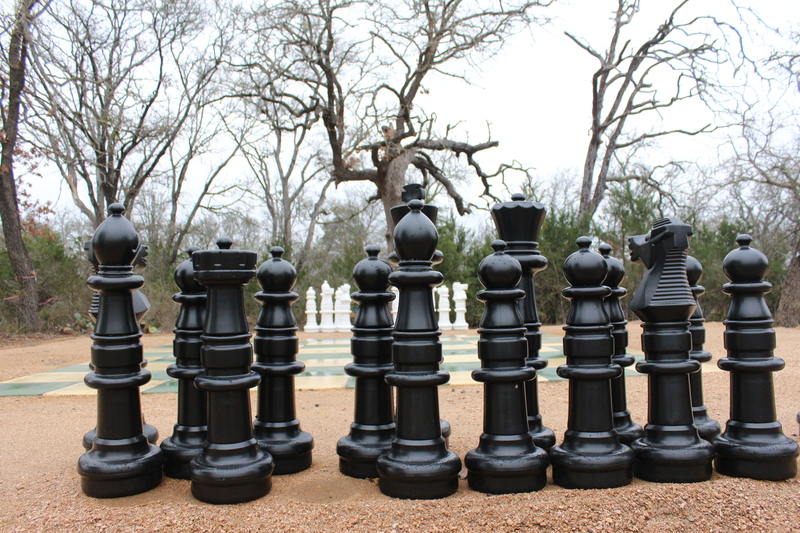 The business can be found in Northeast Austin. 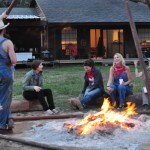 Adventure coordinator, Katie Ford, who started working with Sanders in 2013 after participating in one of his metalworking camps in Marfa, Texas said she enjoys the community the camps create. 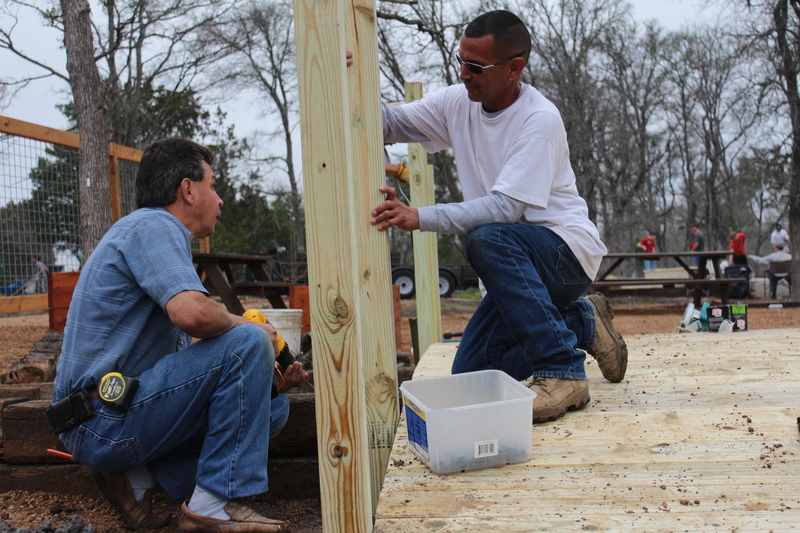 In addition to building a community, Design Build Adventure gives back. 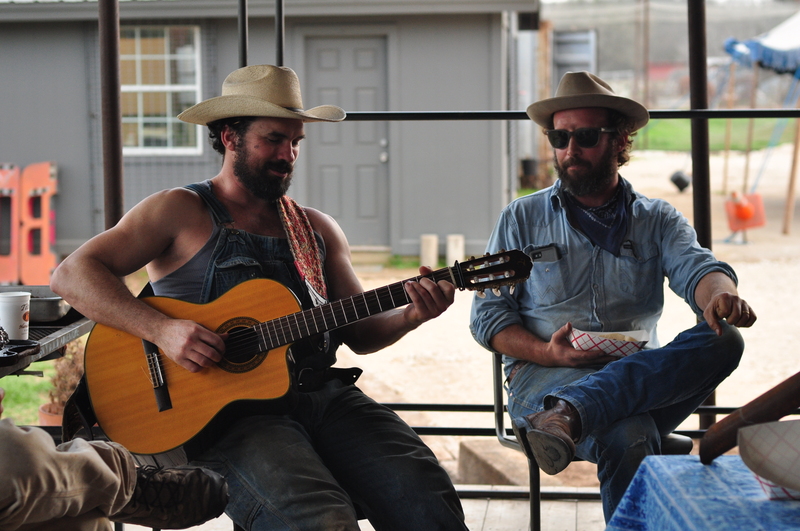 Their Heavy Metal Camp helps benefit the Health Alliance for Austin Musicians. Ford said she’s personally inspired by Sanders who likes to weave charitable causes into the work he does, especially in the education aspect of the business. 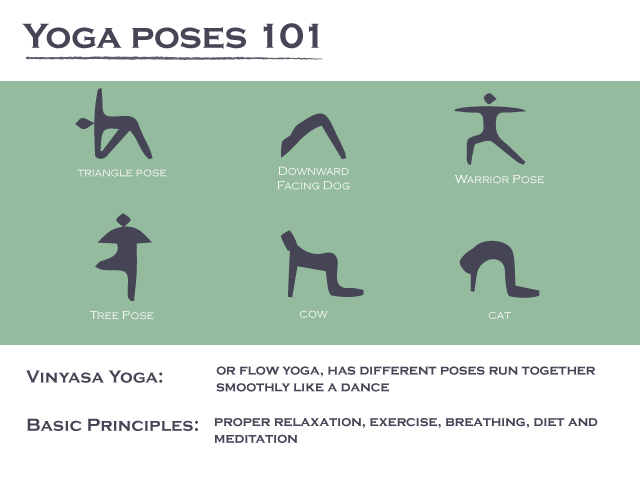 After the lunch and learn session at the yoga and welding workshop, the adventure crew asked the participants to design their favorite yoga positions by sketching them out on construction paper or using pipe cleaners. 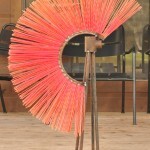 Once students were done, they worked in the shop to create their designs in metal. “They’ve honed in on a vision and now they just want to make it happen,” Ford said. 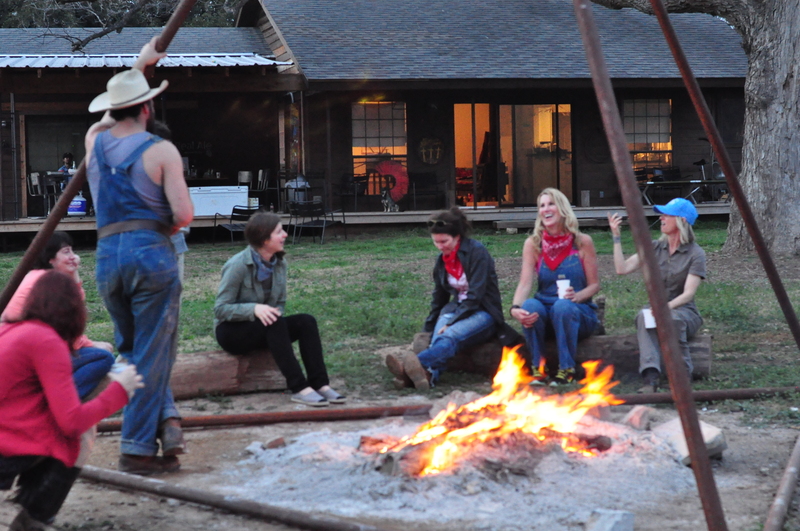 When the workshop ended at sundown, the participants gathered to share their metalwork creations over cold beer and street tacos. The Spirit of Warrior II. The Spirit of Warrior II came together with loose metal scraps Cobb found in the back of the shop. Cobb said she tried to put her design in a yoga pose, but it didn’t want to be in a pose. “It was kind of like the metal just told me what it wanted to be,” she said. Cobb said the enthusiasm of the crew and the sense of adventure she experiences were her favorite moments of the workshop. 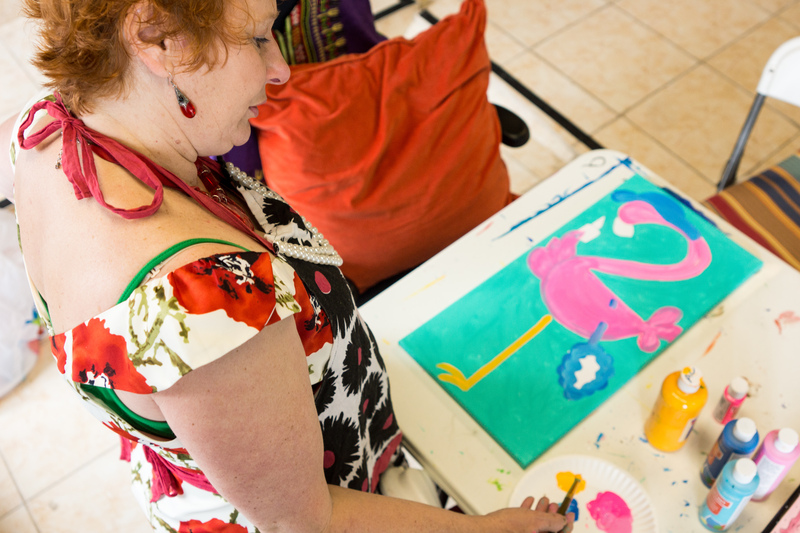 “With their support they help you have the confidence to make something that is meaningful,” she said. 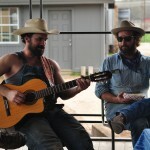 After the show and tell session, adventure crew member and Austin singer-songwriter Dan Dyer entertained the group with his guitar by the campfire. When it comes to the adventure team, Jack Sanders said most of his team consist of people who started doing something for the business. The Design Build Adventure’s website describes the team as an “evolving group of highly skilled collaborators and creative thinkers” whose services range anywhere from renovation to demolition. 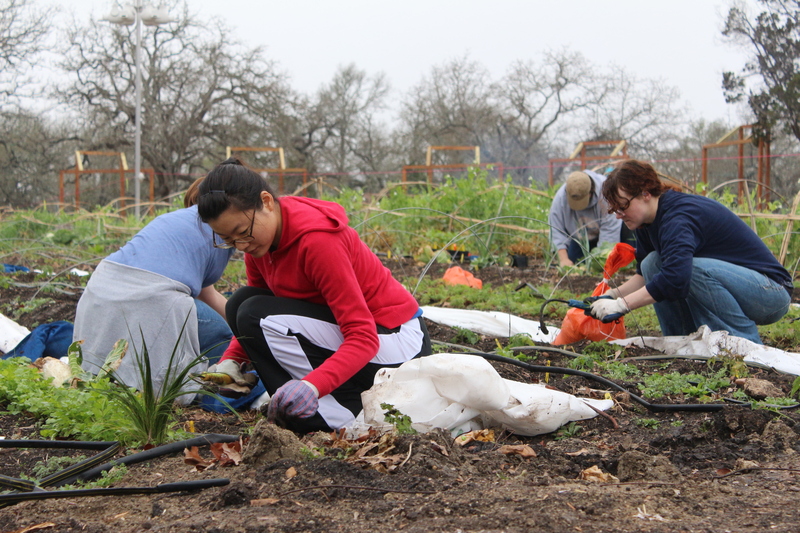 A group of volunteers sow the fields at the Community First! 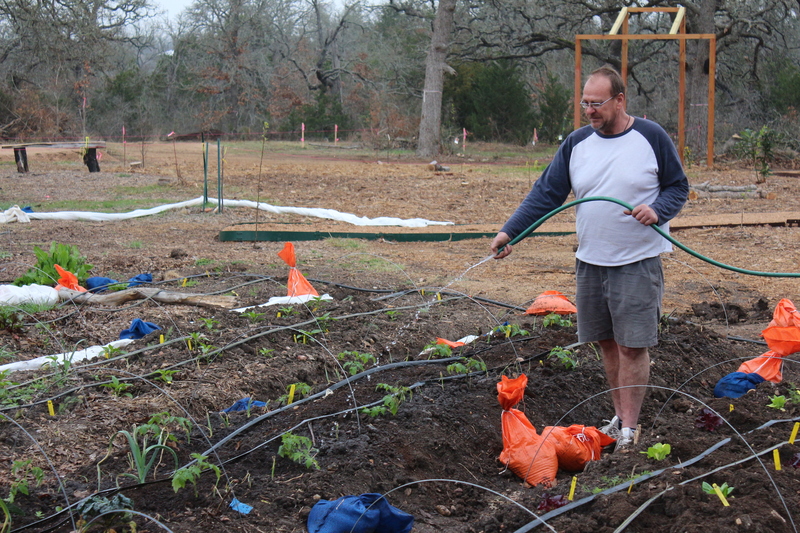 gardens located in East Austin. 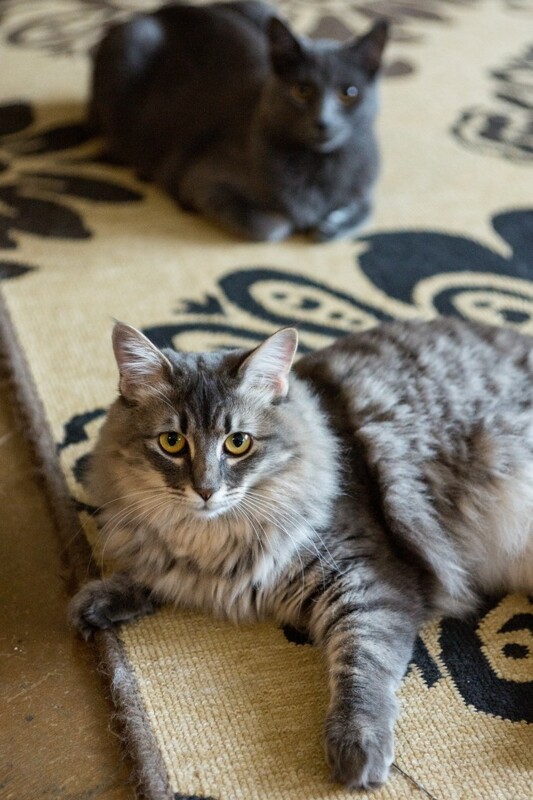 Photo by Joan Vinson. The people behind the Community First! 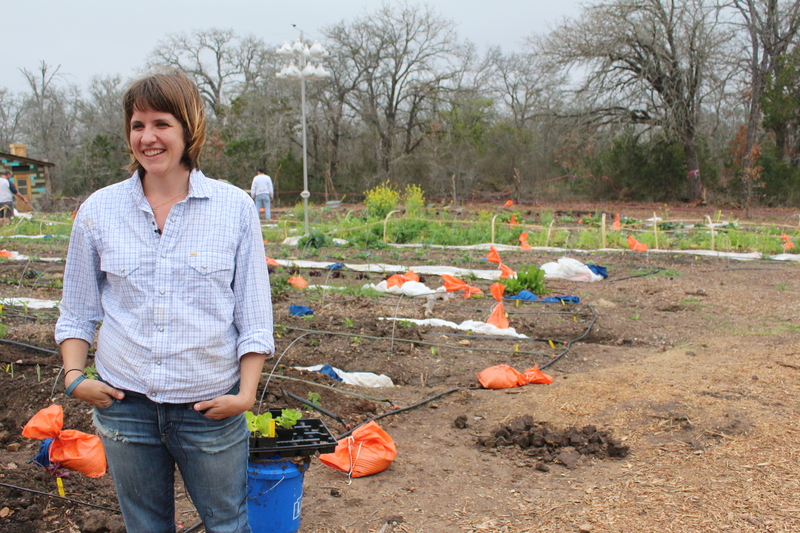 project picture a $7-million, 27-acre space in East Austin filled with housing, living and gardening opportunities for Austin’s chronically homeless. 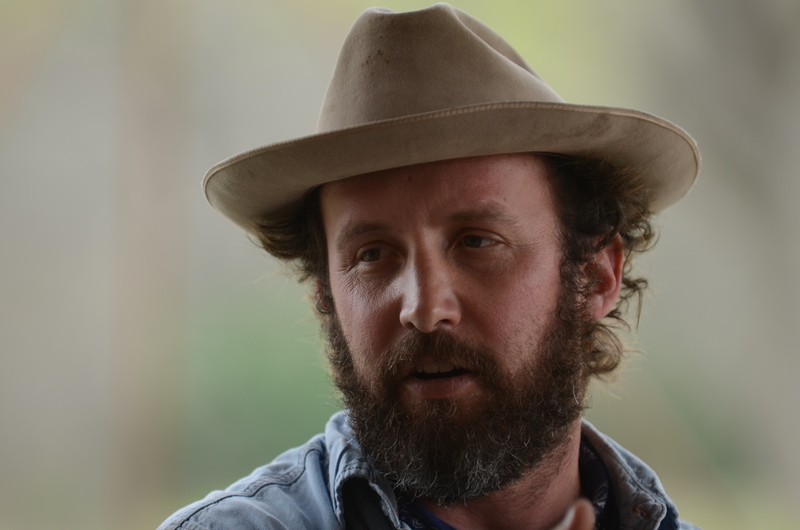 “Much more than wanting to be rid of the homeless as if they are a problem, we want to hold onto them because they are a treasure and we think that Austin is really going to see that and come up around this space,” said Heidi Sloan, who is in charge of animal husbandry and pasture management for the project. 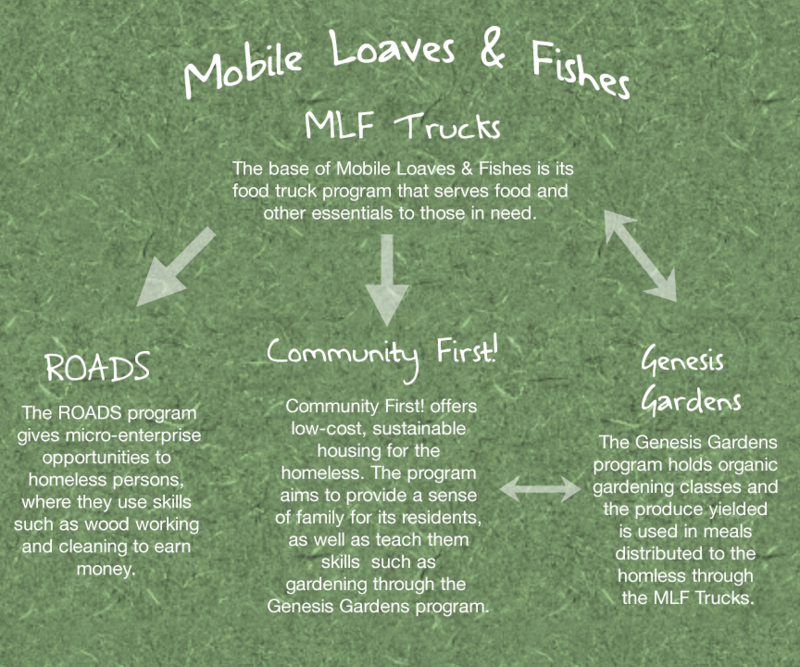 Community First!, located at 9301 Hog Eye Lane, is just one program under the umbrella of Mobile Loaves & Fishes, an organization that started 15 years ago by combining food trucks and ministry to deliver food to homeless people. 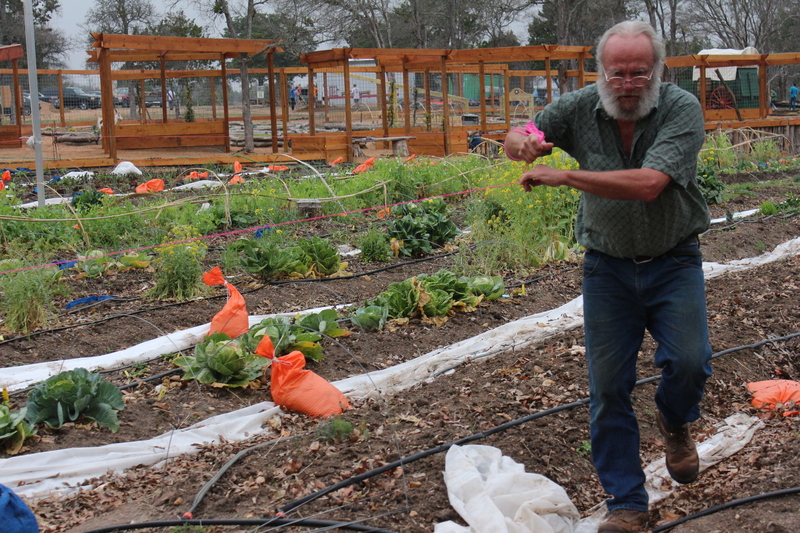 Along with Community First!, it leads two other offshoot programs: the Relationships & Opportunities Allowing for Dignity & Security program and Genesis Gardens. Many of the programs overlap in their day-to-day activities and utilize volunteers for most of their work. Info from MLF.org. Infographic by Elyana Barrera. 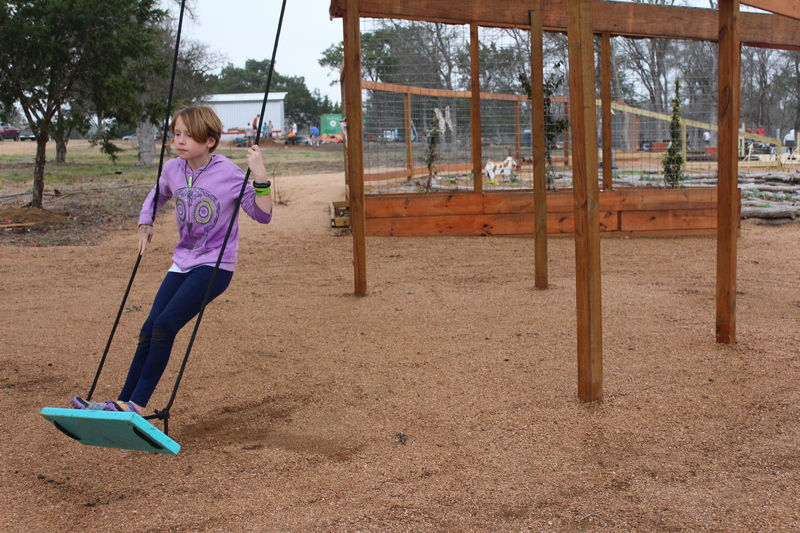 The first installments in the community project are the gardens, pathways, and fire pit areas, and this is why Sloan, who is actually affiliated with Genesis Gardens, has her hand in the project. 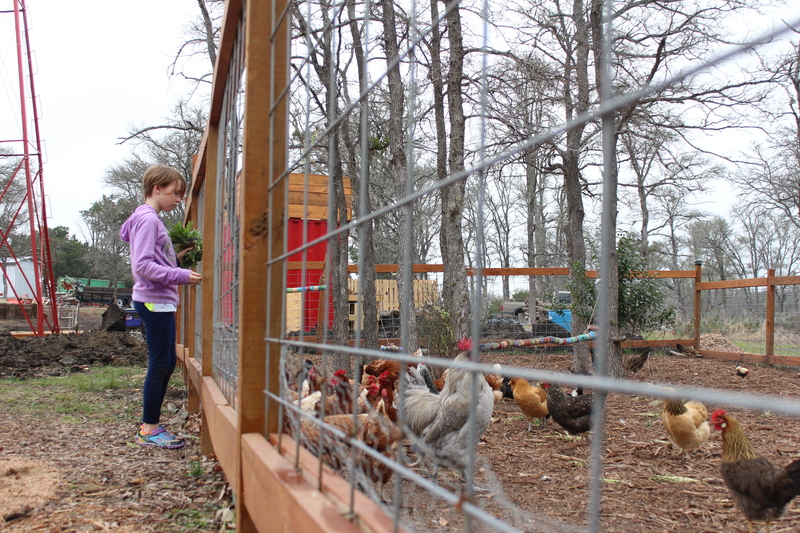 Standing next to a chicken coop, a young volunteer prepares to feed the chickens with food she picked from Genesis Gardens. Photo by Joan Vinson. Having numerous gardens, pathways, fire pits, a chicken coop and life-sized chessboard already in place, the group hopes to have the housing areas under construction by the summer and some residents moved in by next year, said Sloan. 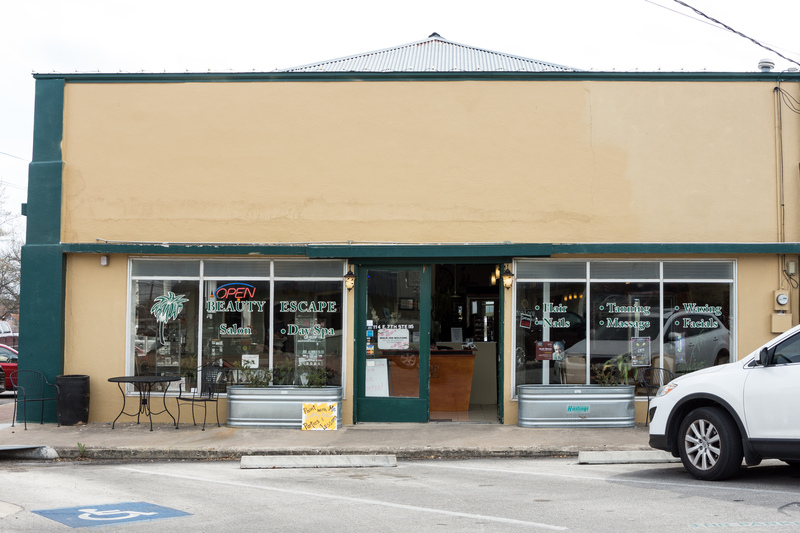 She added that there are also plans for a great hall building, an Alamo Drafthouse drive-in theatre and a bed and breakfast, all to offer employment opportunities to the community’s residents. While sectioning off parts of Genesis Gardens, a volunteer is careful not to step on plants. Photo by Joan Vinson. The housing in this space will not be free, and Mobile Loaves & Fishes president Alan Graham said his plan will feature RVs and micro houses at four different price models: $90, $200, $325 and $375 per month. While Graham began with food trucks 15 years ago, it was 10 years ago that he formed the idea to lift the homeless off the streets. They currently house previously homeless people in RV parks all across the city. 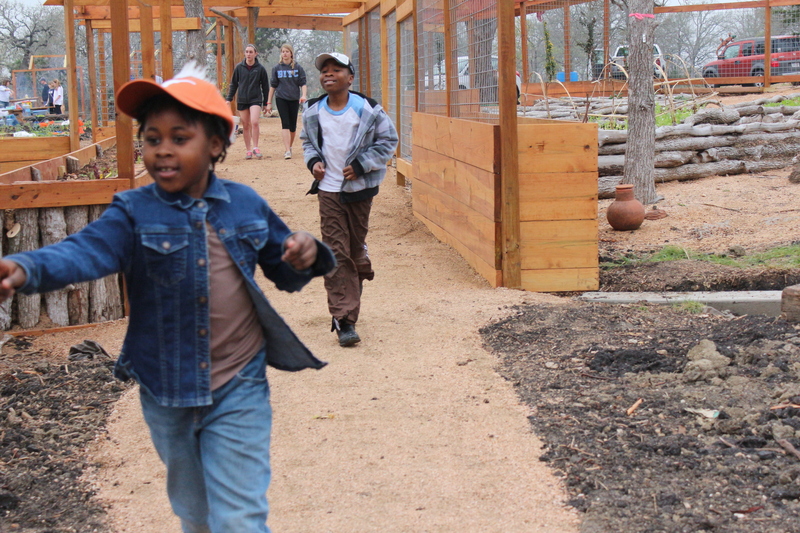 A group of volunteers scurries to the chicken coop. Photo by Joan Vinson. Heidi Sloan, director of Animal Husbandry and Pasture Management, expresses her joy of working with the nonprofit organization, Mobile Loaves & Fishes. Photo by Joan Vinson. 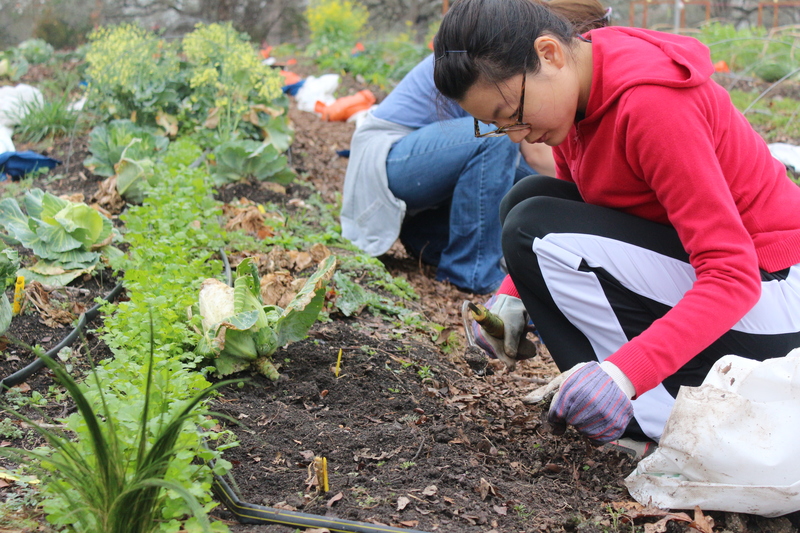 A volunteer plants seeds at Genesis Gardens, which is on the Community First! property in East Austin. Photo by Joan Vinson. 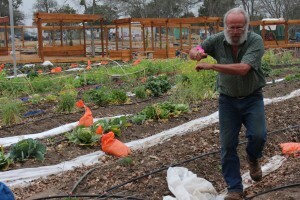 Ellis Johnston, a former member of the homeless community, waters plants at Genesis Gardens. Photo by Joan Vinson. Standing on a swing, a young volunteer takes a break from her duties at the Community First! 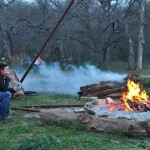 site in East Austin. Photo by Joan Vinson. A volunteer lodges a plank of wood into a bed of concrete to construct a bridge. Photo by Joan Vinson. 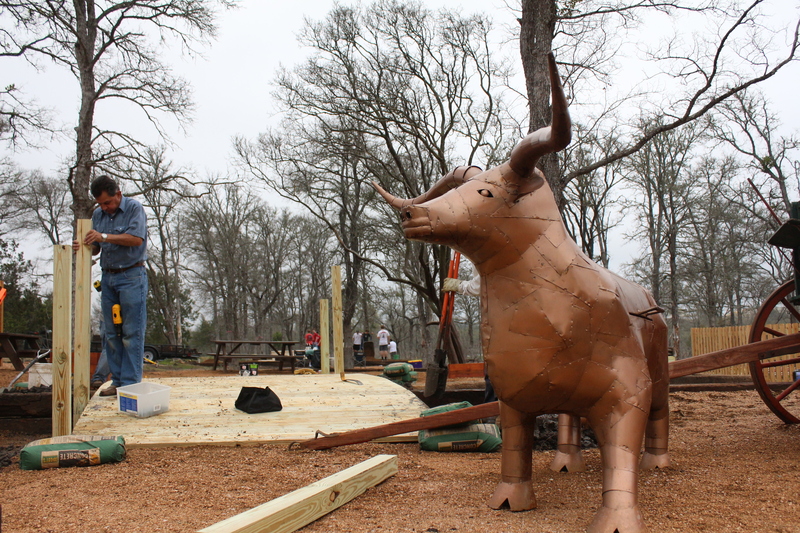 Standing next to a metal longhorn, a volunteer digs a hole in preparation to construct a bridge. Photo by Joan Vinson. Two volunteers work together to create a bridge over the Memorial Gardens on the Community First! 27 acres. Photo by Joan Vinson. Peeping its eye out of the chicken coop, the bird takes in all of the activity going on around him. Photo by Joan Vinson. 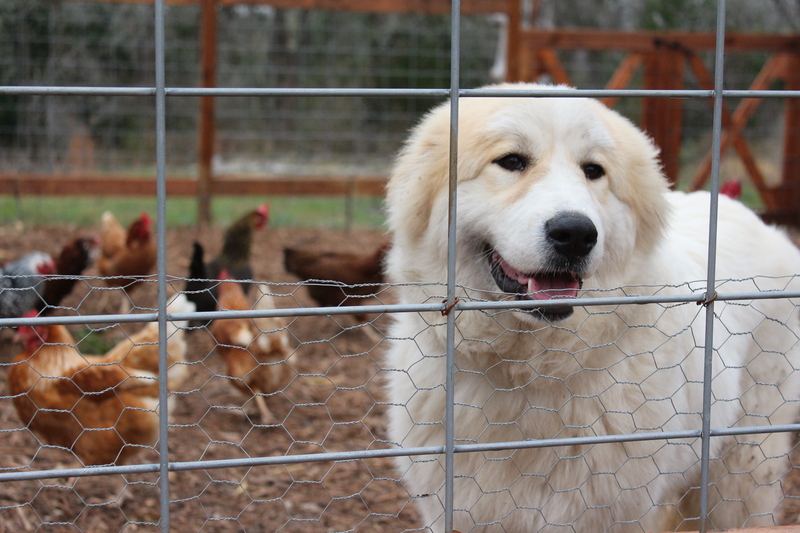 A dog makes his way into the chicken coop at the Community First! site. Photo by Joan Vinson. 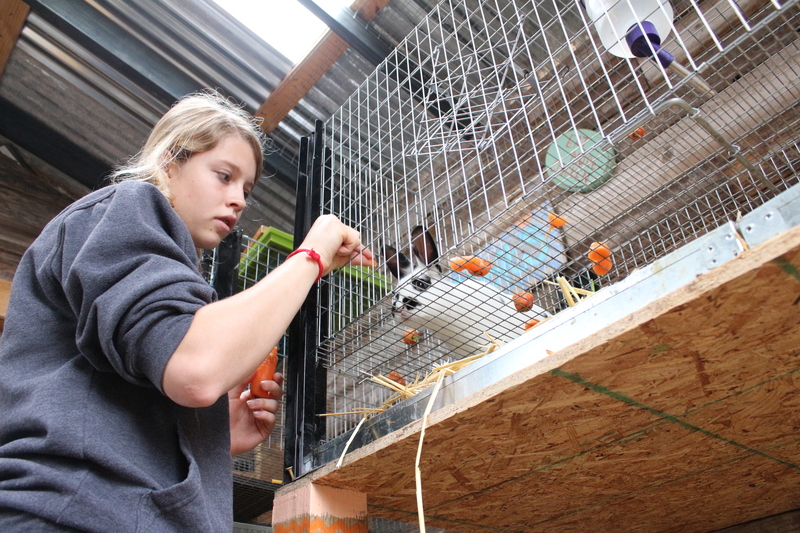 Rabbits and chickens are some of the many animals at the Community First! 27 acres. Photo by Joan Vinson. 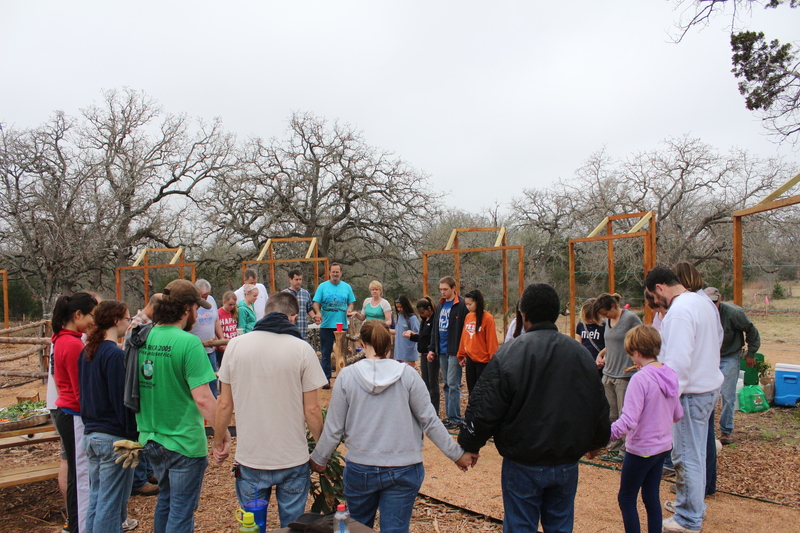 Standing together in prayer, a group of volunteers link hands before digging into their Saturday brunch. Photo by Joan Vinson. Mother of five Kelbi Schlueter enjoys taking her children to volunteer with her and thinks it’s an important experience for her children. Amanda Qarashi works in the information and technology department for Mobile Loaves & Fishes but is an avid volunteer with its different programs. Mayor Lee Leffingwell has expressed his support for the project. “This project is an opportunity if it can flourish and grow to remove the [Austin Resource Center for the Homeless] from downtown,” Leffingwell told KVUE reporters for a story in November of last year. While it may solve problems downtown, many are worried about the neighborhoods surrounding Community First! in East Austin and how it will affect them. When Mobile Loaves & Fishes took their plans to the city early in 2013, many residents, business owners and associations argued against the project. Kenneth Koym, president of Imperial Valley Neighborhood Association, was a lead writer on a petition to stop the project. When the Multimedia Newsroom researched his name it was too late for an interview but a reporter found YouTube videos he posted online discussing Community First!. He said residents on properties neighboring Community First! are worried about increased crime and decreased property values. Stories also surfaced in reports by Koym to officials in state and federal governments that questioned Mobile Loaves and Fishes’ business practices and said that homeowners, families, children and elderly taxpayers got “bullied” in the organization’s deal with the city. “We understand that the homeless need to have a place but the place for them has been selected not by us…but rather by a city council that approved of a staff recommendation,” he also says in the YouTube video. A call to Ellis Johnston, a once-homeless man who now volunteers with Community First!, was not returned by press time. Graham has said the community will be a secure, gated area and doesn’t anticipate any issues, but actually encourages surrounding neighborhoods to get involved in the project by visiting MLF.org. He added that, for him, Mobile Loaves & Fishes is always rooted in his faith. Stencils of a homeless man’s face, by Seve Garza at the Hope Wall. Photo by Rachel Hill. 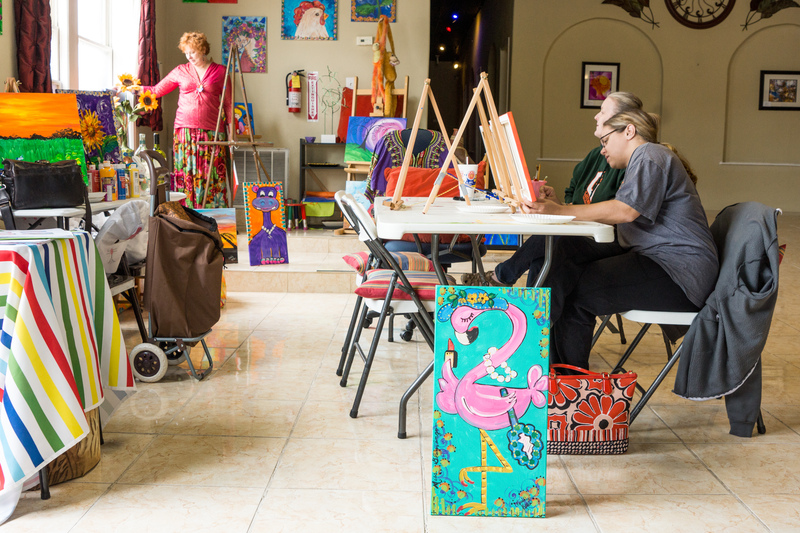 Most artists were born with an easel in their cribs and a colored pencil in their hands, but local Austin street artist, Severiano ‘Seve’ Garza, learned his artistic skills following tutorials on YouTube. At 16 he was diagnosed with Osteochondritis dissecans disorder, and was unable to continue with contact sports. In 2010 as a sophomore in college at Chapman University, in Orange Calif., Garza was at a standstill because he could no longer play baseball, and was compelled to seek out a new activity and thus created a new identity in art. “Honestly I was really bored and needed something to take up my time instead of sports,” Garza said about his beginnings in art. Some of his initial work included photos of celebrities, which he would morph together with animals on Photoshop. His most popular Photoshop project was of Paris Hilton with lizard features. He later looked into tutorials on stencils, which became his main medium for his artwork. “I learned how to turn images into stencils, so I developed my own style,” Garza said. 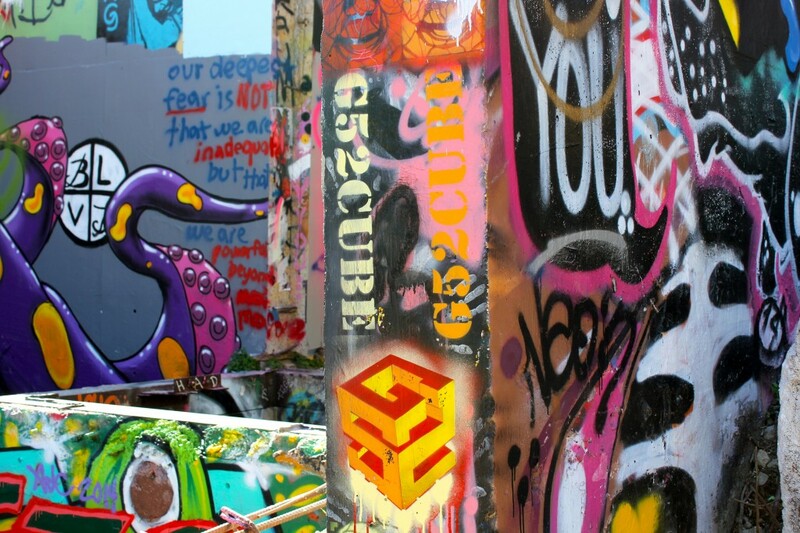 Armed with an arsenal of spray paint bottles, a box of stencils, and spray paint under his nails, Garza does most of his work at the Hope Wall in Austin. He often uses faces of those he encounters in his life journey as the subject of his graffiti art and duplicates and layers the image several times. The tag name originated from his great grandfather who drove 51 head of cattle from Central America. The animals were branded with ‘G51’. His grandfather then used the brand for his engineering firm and his father uses it currently for his venture capitalist firm. 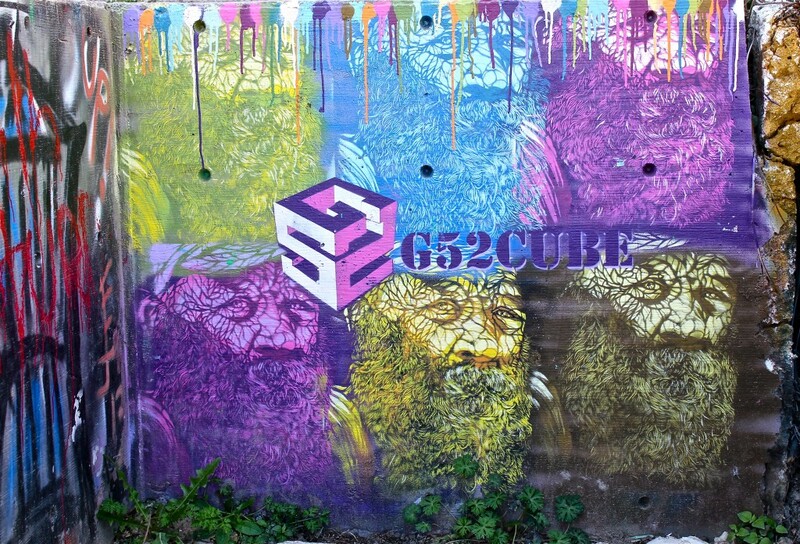 Garza’s tag, g52cube. Photo by Rachel Hill. 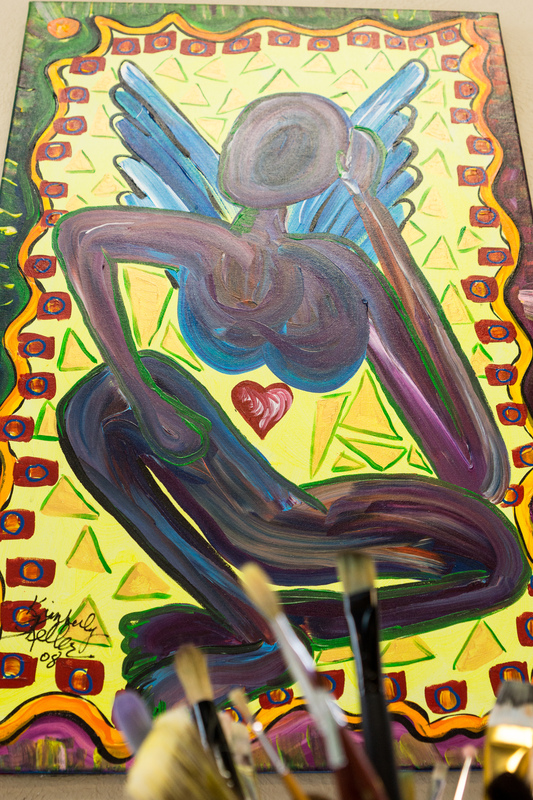 When his business-minded father found out his son, who majored in business marketing with a minor in studio art, decided to be an artist full time, he was initially hesitant to support him. “It’s like fishing in the ocean versus a small pond, if you’ve done your research [for a target audience] you have a better way to sell,” Garza said. A lot of his artwork is solely based on his interests but he also works with Spartx street artist crew, a group of artists that helps curate the Hope Wall. 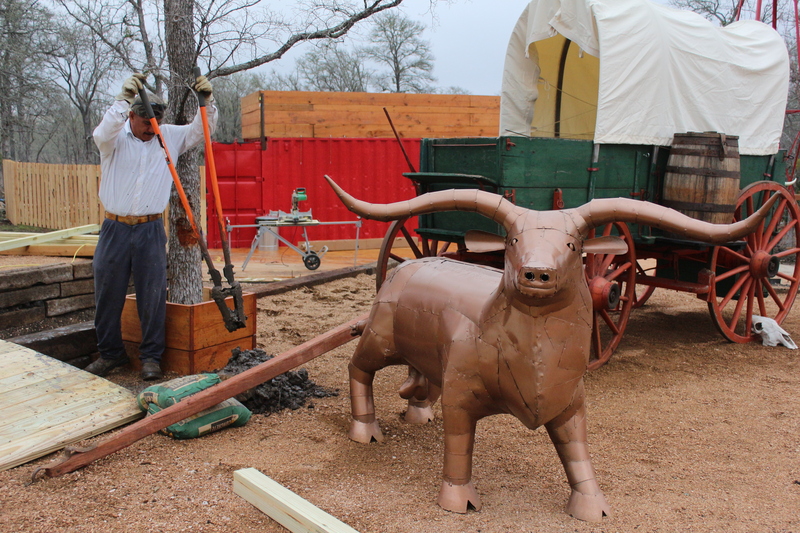 “I do a lot of work for them whether it’s photo, video or paint jobs,” Garza said. As a street artist, Garza spends most of his time creating graffiti, but as a self-proclaimed activist, he also devotes his spare time to a yearlong awareness project he started that documents the lives of homeless people in Austin. “Forty percent of homeless people suffer from mental disabilities,” Garza said, while elaborating on his interest in the local homeless community. Garza hopes to spread awareness through video interviews and paintings of the homeless men’s faces on the Hope Wall. In March, Garza was able to speak at TedxYouth in Austin for a crowd of 700 high school and middle school students about his work and identity as a street artist. In the future, Garza hopes to own a hotel or restaurant featuring art as a way to make money while cultivating new artists in the process, but for now he sells his paintings on his website and uses the Hope Wall as his giant canvas. Donny Osbourne enjoys some food from one of the trucks on 5th & Colorado. A hearty Indian-Mediterranean meal with a side of entrepreneurship and extra Longhorn pride, please. The University of Texas at Austin is widely known for its motto “What starts here changes the world,” and Fahad Raza has brought this long-lasting tradition to life. 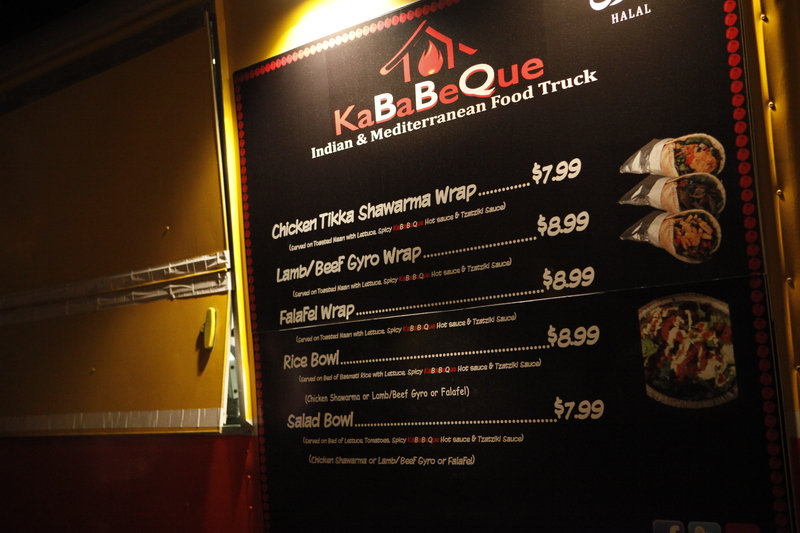 With the help of his brother-in-law, Gohar, Fahad, an engineering sophomore, opened Kebabeque, an Indian and Mediterranean food truck located in the heart of Austin, at the intersection of Fifth and Colorado. The options at the Kebabeque food truck. “After working at a friend’s food truck during last year’s South By Southwest festival, chemistry sophomore Fahad Raza decided a food truck would be a manageable and profitable business venture. 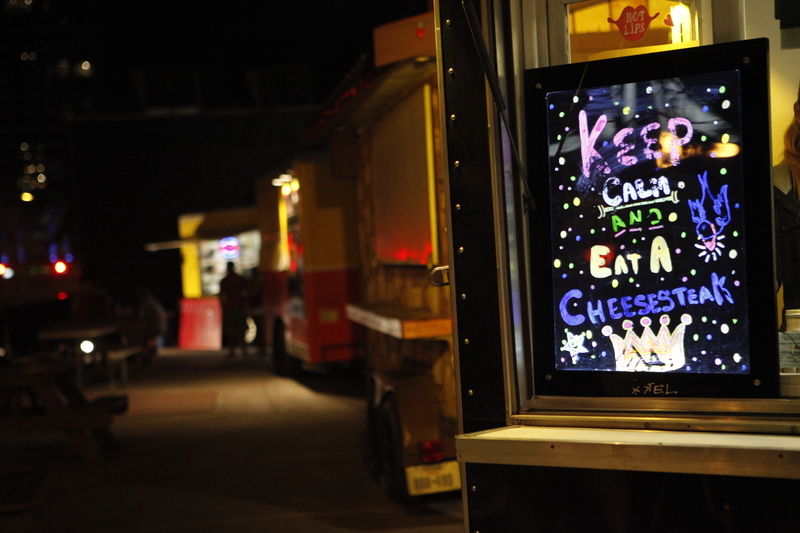 He purchased a food truck on Craigslist, painted it himself and began planning a menu,” as stated on The Daily Texan. Surely finding a balance between being a co-owner of a flourishing business and being a full-time student can prove to be quite a task, but Fahad has figured out how to do it – and do it well. 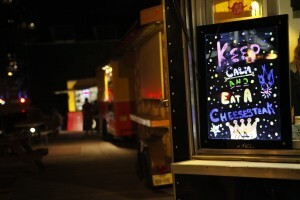 A myriad of food options can be found among the food trucks residing on 5th & Colorado. 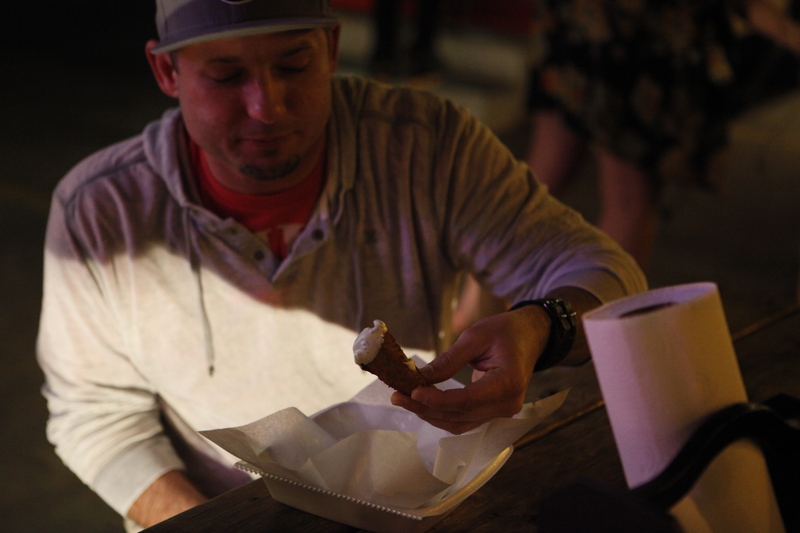 The word about Kebabeque has spread among Austinites, and in a city where competition among food truck is so high, not all can say the same. “Unlike traditional restaurants, food trucks require fewer operating hours, less maintenance and a smaller staff, [but also a lot of effort]. Raza said the experience [would] teach him how to be an entrepreneur. He said his goal is to eventually make enough revenue to have his own staff and more food trucks,” as stated on The Daily Texan. Street performer Pablo Gigante sings bluesy tunes to passersby at the food truck park. In the meantime, Fahad and his brother-in-law will continue to do all of the prepping, cooking, cleaning and money managing for Kebabeque, and Raza plans to graduate in the upcoming three years. Fifty years after cigarette smoking was first linked to a significant increase in cancer risk by the American Surgeon General Report, a new way to light up has caught fire in the United States, specifically among young people. E-cigarettes, nicotine inhalers that heat a flavored liquid into a vapor, giving the smoker the same rush as a puff of a traditional cigarette, are gaining popularity despite uncertainty surrounding potential health risks. Because the “vaping” phenomenon is so new, the jury is still out on the long term risks associated with smoking e-cigarettes. While initial studies have shown that the electronic versions contain fewer trace elements of harmful toxins than a traditional cigarette, it doesn’t necessarily mean they are safe. Part of the appeal of the e-cigarette is the potential to help heavy smokers wean off their nicotine habit. Studies seeking to prove the effectiveness of e-cigarettes in helping smokers quit have been problematic and have produced mixed results. Some smokers continue to light up traditional cigarettes, substituting the e-cigarette only when necessary in public spaces. However, others have found that purchasing the e-cigarette has helped them kick their cravings. UT sophomores Zoe Reames-Zepada and Gandalf smoke cigarettes outside of their West Campus apartment Tuesday evening. Since tobacco was banned at The University of Texas in 2012, students are rarely seen smoking on campus anymore. Estuardo Loranca, a 20-year-old food service worker for the University of Texas, says that he feels the e-cigarette has made him less dependent on cigarettes. Although he has had the urge to smoke traditional cigarettes, the previously two pack a week smoker hasn’t picked one up since switching to the e-cig eight months ago. “Before when I was waiting to go on break it was like, ‘I can’t wait to go have a cigarette I can’t wait to go have a cigarette,’ and it’s not like that with the e-cigarette. I don’t have those urges. I just take it out and take a puff and that’s it,” Loranca says. The model he bought allows him to adjust his nicotine level as he weans off his addiction. Loranca says that the switch for him has been relatively easy, without the anxiety and other withdrawal symptoms he experienced when trying to quit cold turkey a few years ago. He also says that he will most likely continue smoking the e-cigarette even when he reaches his eventual goal of kicking his nicotine habit completely. “I want to get off the nicotine and maybe switch to a flavor, like a fruity flavor. There are hundreds of flavors out there. I think I’ll get to the point where I enjoy the e-cig the same way I enjoy hookah,” Loranca says. A customer glances over the many e-juice flavors. Flavor Vapor features over 100 liquid flavors, priced between seven and 16 dollars, and occasionally takes requests for new ones. 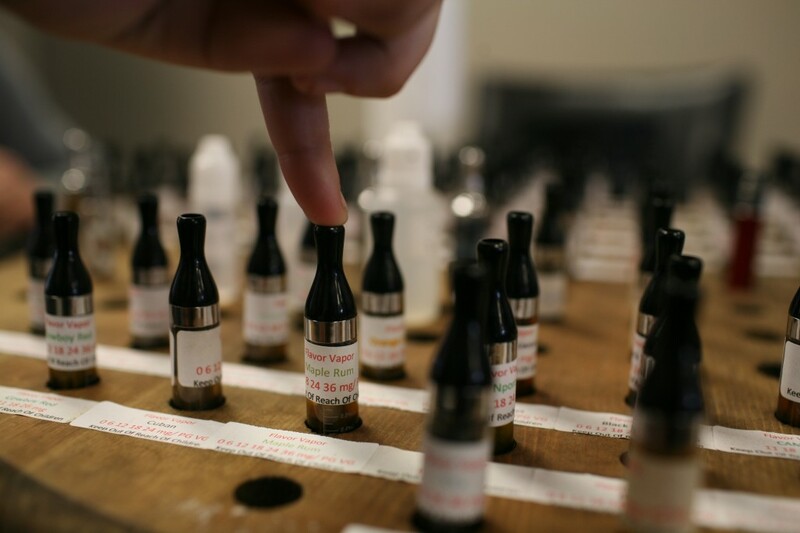 The many flavors are a large part of the current marketing strategy for e-cigarette promoters, and large part of the problem for those concerned with them. A January newscast by CBS news on the topic reported that most smokers become addicted by the age of 18, and almost all smokers become addicted before age 21. Loranca admitted to have started smoking more than six years ago. There is concern that e-cigarettes will act as a gateway for young smokers to become addicted to all tobacco products, rather than exclusively encouraging current smokers to quit. Another controversial aspect of the current e-cigarette market is the lack of FDA regulation. As of right now, the Federal Food and Drug Administration is not involved in the manufacturing and distribution of e-cigarette products. This means that e-cigarette companies can’t be held accountable for what is in their products. A fact that Loranca says makes him thankful that the e-cigarette has made him a less frequent smoker. “I’m actually not even using it as much as I expected to. It’s almost disappointing in a way because I kind of enjoy smoking, but at the same time I’m happy about it. That’s less toxins going into my body,” he says. Despite overwhelming evidence that smoking cigarettes greatly increases the risk for heart disease, lung disease, and at least a dozen cancers, 44 million Americans continue to light up every day. For decades, smoking was glamorized by prominent figures like Edward R. Murrow and Audrey Hepburn in Breakfast at Tiffany’s. Now it is the e-cigarette whose use has taken on a similar glamorization, attracting young people but raising skepticism among parents and medical professionals who encourage consumers not to fall victim to the same deceptive practices used by big tobacco companies in the past.